Jani’s previous post, Geographical wind smoothing, supergrids and energy storage, focused on distributed wind alone. In this follow-up, he turns his attention to solar combined with wind. Earlier, I wrote on how crucially an unreliable sources of power such as wind depend on fossil fuels. Based on real world production data from around the world, I noted that even with massively distributed production wind power is very variable and necessitates a reliable backup power source (typically from fossil fuels) which must be able to produce essentially all the power society consumes. A way around this problem would be a massive energy storage, but I found the size of the required storage to be unreasonably large. One typical response to findings such as these, is to brush them aside by claiming that even if true, the results will not matter since we will have many different renewable energy sources acting together (as if there is some “harmony” in two essentially random signals). Most importantly quite a few people base their vision of future energy production on a mixture of wind and solar power. For this reason I felt the need to return to this problem so that also solar power is considered. Unfortunately, I have yet to find a good source for real world production data for solar power. The best I have come up with are images (typically of the daily production), but raw data is better hidden. Somewhat annoyingly only hourly data is provided. We know from BNC a mong others that solar power (especially PV) can have large swings on shorter timescales. Therefore, this limitation may have important consequences. Nevertheless, let us ignore the torpedoes with an understanding that the solar power we talk about here is such that sufficient storage has been already implemented to smooth out hourly variation in production. So keep in mind, that the starting assumptions for solar production have a bias towards the optimistic side. 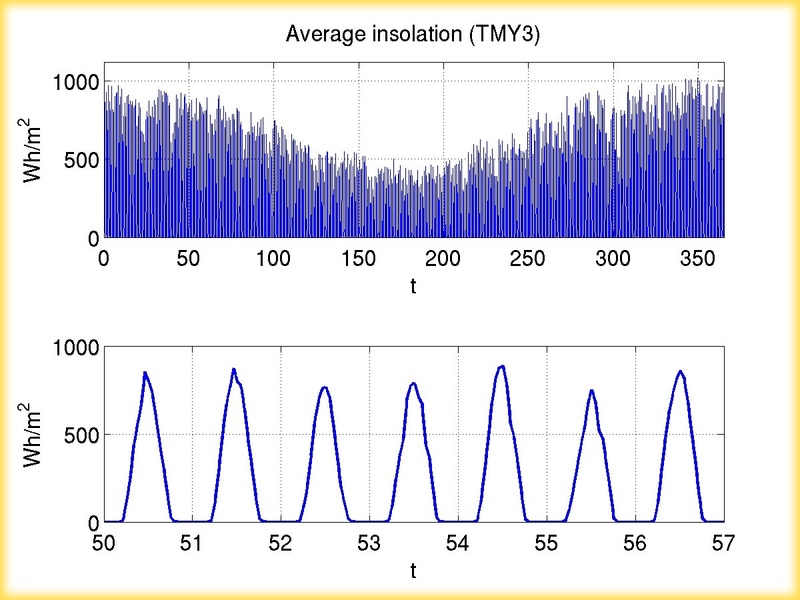 Since the production data for wind power is given every 5 minutes I will linearly interpolate the solar insolation data to deduce the production of solar power every 5 minutes (link to the data here). As in the earlier study the data corresponds to one year starting July the 1st. and the consumption data corresponds to the Bonneville Power Authority load with a possible scale factors to suit my needs. Now that we have rather massively distributed production of both wind and solar power, what do we find? In Fig. 1 I show the average insolation from six US locations (the wind data I have discussed earlier). Daily variation is apparent as is also the large seasonal variation between summer and winter. In this system the solar power has an impressive 20% capacity factor. OK, having the relevant data available let us then proceed to check what backup requirements we have if we are to integrate this solar production in such away that production and consumption match (as they must). Figure 1: The average insolation as an average over 6 sites in USA. The figure shows both the yearly data as well as an example of one random 7 day period. If we choose the installed solar capacity such that the solar power produces the same amount of electricity over the year as our model society consumes, we find that a massive 55% percent of the electricity is generated with reliables (typically fossil fuels). These reliable power plants must be able to produce 97% of peak demand and they are running at a capacity factor of 36%. Solar power itself sees its capacity factor drop to 9%. These results are essentially caused by the seasonal variation of insolation (too little production in the winter) and the fact that solar power reliably produces nothing when it is dark. It is perhaps not worth pointing out that this scenario is not compatible with the goal of decarbonizing our societies. How about mixing solar and wind? Since the sun shines during the day when consumption is higher one can guess that unreliables production matches the consumption better if there is some amount of solar in the mix. On the other hand the solar output varies even more than the wind output since, unlike wind, it predictably produces nothing when it is dark. (Of course, if the sun stops shining for good, eventually the winds disappear as well.) So presumably one shouldn’t push the fraction of solar production too high. This suggests some “sweet spot” for the fraction of installed solar capacity if we are to match the production of wind and solar optimally to consumption. 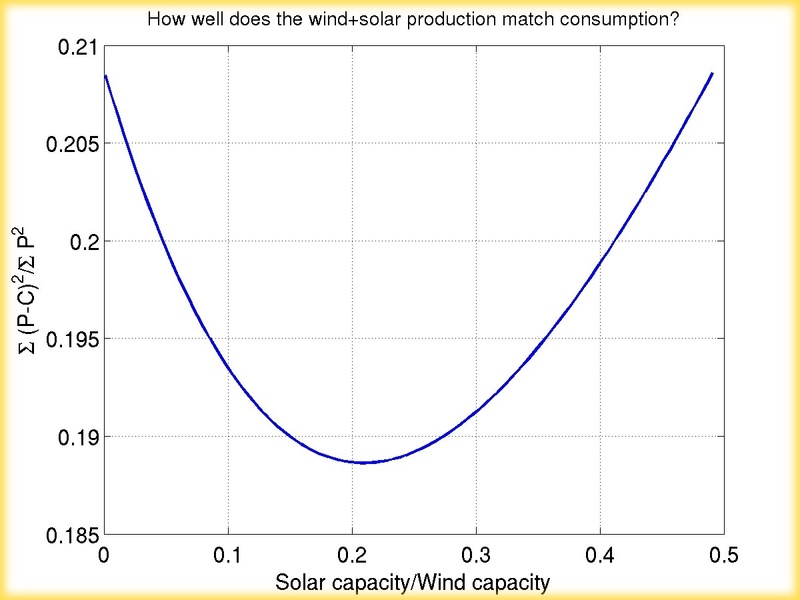 Figure 2: How well the solar and wind production match the consumption as a function of solar capacity. For comparison, European renewable energy council and Greenpeace postulate a more ecumenical figure close to 50/50 for the split between wind and solar. (Since no explanation for this split was apparent, cynic in me is left wondering if this choice simply reflects the relative turnovers of respective industries which presumably correlate with spending on lobbyist.) However, if we are to use such a mix and produce as much power with wind and solar as we consume, it turns out that we need reliable power plants with a capacity of 91% of peak demand. They will have a capacity factor of 17% and amount to 24% of total production. Combined capacity factor of wind and solar has now dropped to around 19%. This case is presented in Figs. 3 and 4. In my earlier study with just wind power I found that fossil fuel power plants accounted for 21% of production (and with a capacity 88% of peak demand). So adding this much solar into the system has actually made things worse! The culprit is again the seasonal variation of insolation which reaches minimum during the winter (in northern hemisphere) when the consumption is often greater. 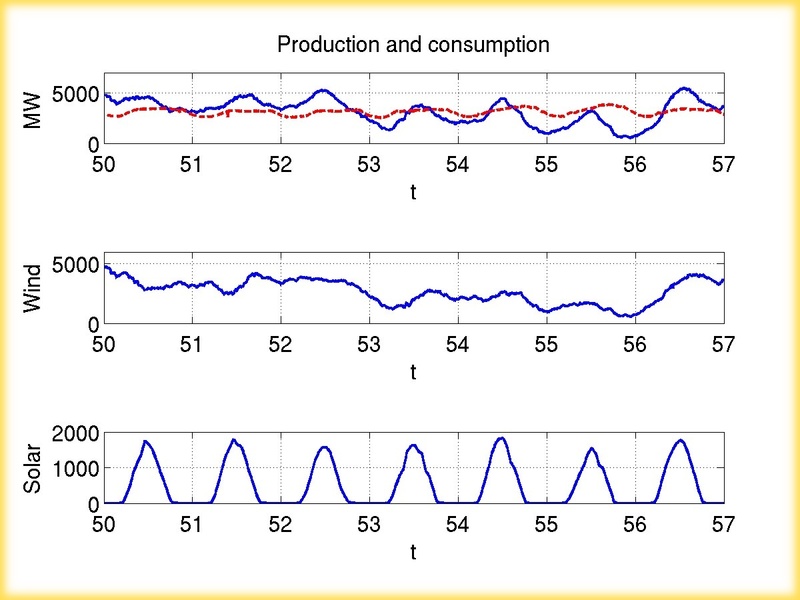 Figure 3: A snapshot of the production and consumption during a one week interval when solar and wind capacities were equal. Figure 4: The yearly production and consumption together with the reliables output when solar and wind capacities were equal. How about choosing the solar capacity to be the “optimal” 0.21 of wind power capacity? Then we need reliable power plants with a capacity of 89% of peak demand. They will have a capacity factor of 14% and amount to 19% of total production. So, yes! Adding solar power to the mix can sometimes help, by reducing the electricity produced with fossil fuels from 21% to 19%. Unfortunately, the required capacity of reliable power plants is actually slightly higher than with wind only. I will not dare to compute the cost of CO2 abatement under such a scenario. Figure 5: Solar capacity is 21% of the wind capacity. Weekly snapshot. Figure 6: Solar capacity is 21% of the wind capacity. Yearly data. To conclude, I note that adding solar power and wind without massive storage to the mix does next to nothing to remove the need for fossil fuel based energy infrastructure. Scenarios based on wind and solar power are fundamentally reliant on fossil fuels and sooner this is understood the better it is for climate. Currently the mirage of purely unreliables based energy production essentially maintains the use of fossil fuels for as long as the eye can see both for technical and financial reasons. While doing these exercises I occasionally get a feeling that I am fencing with a tetraplegic. You might say this is not sportsmanlike, but unfortunately the political reality is that the mirage of solar and wind based solutions is a tetraplegic which hampers us from confronting the real and difficult issues with respect to climate change. By offering an easy “alternative” this mirage effectively acts as a cover for the damage anti-nuclear activities are causing for attempts to mitigate climate change. Unfortunately fencing must continue since this cover must be removed. The answer is no, wind and solar cannot provide reliable service, unless there is sufficient storage to ride through periods when there is insufficient wind and sunshine, and there was excess capacity to keep the energy storage at a high level at all times. This implies a system that will need to be overbuilt in order to have sufficient storage and at times of the day, some of the renewable energy will have to be discarded if there is insufficient load and or storage. Interestingly storage does not exist economically at this time to meet the requirements, therefore its not possible at this time to build a system totally dependent on wind and solar. What about solar thermal with energy storage in deserts? Wind and solar are both unreliable, unproductive, and non-dispatchable. Solar is worse than wind almost anywhere on this planet (even in the Sahara desert the capacity factor for wind turbines is higher than PV systems). NNadir has a post with a link to a solar system in Massachussets, representative of not very sunny places in the world (where currently most PV is installed, gee how’s that?). If you wade through the data, you’ll quickly find that solar is very unreliable and very improductive. Most of the time it produces nothing, and the small portion of the time that it does produce it is highly intermittent and climbs only brieftly to its peak, to go down again swiftly. This particular system has a capacity factor of 0.09 which means it isn’t there 91% of the time. Jani, this website also has the option of plotting the data in table form so you can use it for your analysis. Another great resource is the SMA website that has complete realtime graphs available for all of Germany’s solar PV output. Currently there is about 21 GW installed and it produces 5 GW. Less than 20% output and remember it is noon in Germany right now. Already PV is on its way out. At 9 oclock in the morning the PV output is essentially zero. And this is for a sunny winter day. Germany has lots of cloudy winter days, if you check these out you will be utterly dismayed. (capacity factors of 1 or 2% are common on cloudy midwinter days). Is there any country planning to try an energy system with only solar and wind? I am not aware of any real life plans to do that, though one particular plan comes close. There’s an obvious limitation.Solar thermal plants use the classic Rankine steam cycle. That implies a cold heat sink for condensation. IdeaIly, in cost terms that’s heat rejection to the sea, or a large body of water. If that’s not available you end up using some form of evaporative cooling. A fairly efficient fossil find plant will need about 5 million tonnes of water per year per Gigawatt of capacity. You can see why that might be an issue in a desert?. There are steam-air systems but they’re less efficient,more bulky and much, much more expensive. I’d be really interested to see the result if the demand exhibited a moderate production-following – the other important argument in favour of large amounts of wind/solar being that of smart fridges, electric car battery charging etc. at times of low demand/high production. I actually lived in Arcata California for a year. There’s a little thing called the California Redwoods, which is actually a “rain forest,” that makes this site incredibly unattractive for a large scale industrial solar plant. It’s coastal location (prone to days of fog), hilly terrain, mountains to the east (further concentration of weather) are all variables working against it’s favor. These reliable power plants must be able to produce 97% of peak demand and they are running at a capacity factor of 36%. You appear to be taking baseload completely out of the equation. I know of no ISO that operates a grid as you suggest in your study, and that curtails power plants to such low capacity factors. Presumably, it looks impossible to export and import electricity in your model via the grid, and so your system has no real world analogy or test relevance. Presumably, we’re interested in the modeling of real world systems, and assessing the performance of intermittent resources (such as wind and solar). Nobody uses (or intends to use) storage in this way. As I pointed out before, there is no reasonable or practical basis for assessing storage needs as a measure of yearly production. Hence, whatever number you arrive at through this methodology has no practical bearing on the questions you have asked. Your conclusion that “hope is misplaced” is not supported by your study. Unfortunately, I have yet to find a good source for real world production data for solar power. There is actually a great deal of research on the optimum mix of wind and solar resources in a hybrid renewable energy generation portfolio. Sometimes they correlate on a seasonal basis, other times on a daily production basis, and sometimes not very well at all (depending on location). Denholm and Margolis 2007 look at a high PV model in ERCOT grid, Nikolakakis and Fthenakis 2011 for combined resource mix in New York (using real time load data and without storage). For theoretical models (such as your own), and with high renewable energy penetration up to 100% (looking at role of storage, balancing needs, and resource mix between solar and wind) you might consider this one: Heide, et. al. 2011 (drawing on many sources). For their European example, they propose a number of resource mixes that would be optimized for roundtrip storage (60/40 wind to solar), hydrogen storage (70/30), annual balancing (80/20), and load balancing (90/10). This is not an obscure area of research. Your own studies would likely benefit from a fuller consideration of the research and literature on this topic. Jani-Petri, thank you for the post. While your method has some technical flaws (some have already been pointed out by others like EL above, I’ll address some others at the end) the largest problem with this post and your previous post is more fundamental. The fundamental problem appears to be a confusion between the concepts of energy and capacity. From the perspective of someone interested in reducing the use of fossil fuels and the negative externalities associated with their use, energy concerns are paramount and capacity concerns almost entirely irrelevant. A fossil power plant that is turned off, waiting to be started up when it is needed to produce electricity during periods when electric demand exceeds the supply of variable renewable resources, produces no emissions and has no fuel use. Arguing that keeping some fossil-fired power plants around to run a small number of hours per year when they are needed undercuts the emissions savings of renewables is the same fallacy as arguing that a person who rides a bike to work achieves no emissions savings because they still have a car sitting unused at home. In both cases, fossil fuel consumption and harmful emissions are only associated with the use of the fossil-fueled device, and there are no emissions associated with the mere act of keeping those devices around. As a result, your figure that under a wind and solar future we will need to keep enough dispatchable generator capacity to meet 89% of our current peak demand is entirely meaningless from an emissions and fossil fuel use perspective, as simply keeping those plants around to be run during a limited number of hours per year has no emissions or fuel use impact. In your analysis, wind and solar were able to provide 81% of the electricity consumed by society, which is the important number from an emissions and fuel use perspective. In your previous wind-only analysis, 79% of electricity came from renewables. Both are a remarkable achievement, as society’s use of fossil fuels for electricity production would be reduced to around 20% of our fuel mix. In the U.S., fossil fuels are used to produce around 70% of our electricity, so reducing that figure to 20% would cut electric sector fossil fuel use and the associated harmful emissions of pollutants like carbon dioxide, mercury, sulfur dioxide, nitrogen oxides, etc. by a factor of three or more. Moreover, in many parts of the world flexible hydroelectric power plants would be used to provide much if not all of that remaining 20% of generation, bringing electric sector fossil fuel use and emissions down to near zero. Furthermore, any fossil generation used to provide capacity and flexibility would most likely come from flexible natural gas power plants that are drastically cleaner than the inflexible coal power plants that dominate the world’s electric mix today, so emissions would be reduced even further. In many parts of your post, you seem to be attacking a strawman argument that wind and/or solar will or must meet all of our electricity needs, like when you write “Currently the mirage of purely unreliables based energy production essentially maintains the use of fossil fuels for as long as the eye can see both for technical and financial reasons.” No prudent person has ever argued that any one energy source should meet all of our electricity needs, given that different resources naturally have different capabilities to provide the power system with capacity, energy, and flexibility, (for more, see http://www.awea.org/learnabout/publications/upload/Baseload_Factsheet.pdf) as well as the fact that relying on a single source of energy makes society vulnerable to often unexpected common mode failures. Attacking the strawman of 100% renewables is easy, but it does nothing to reduce the allure of getting 20%, 40%, or even 80% of our electricity from renewables. Every country in the world can increase its renewable penetration many times over, cutting fossil fuel use and harmful emissions to a fraction of their current level, before one would begin to see some of the challenges that are likely to arise from getting 80+% of our energy from renewables. Of course, it is highly likely that technological progress in areas like demand response, plug-in hybrids, energy storage, and other areas we can’t even imagine today will have solved those problems by the time we get there. Regardless, to argue that we shouldn’t go to 20% or 40% renewables, which we know we can do (see the success of countries like Germany, Spain, Ireland, Portugal, and Denmark, or even US states like Texas), because a fictional 100% renewables world does not work with today’s technology, is a dangerous misconception that will relegate us to a future of rising fossil fuel use and emissions if we do not use the cost-effective and proven clean energy resources available now. Do not fall into the trap of letting the perfect be the enemy of the good. As far as the more technical flaws in your methodology, the main flaw is that your data sources do not adequately capture the geographic diversity you would get from the large-scale deployment of wind energy you are attempting to model. Taking data from a relatively small amount of wind deployed in three relatively small geographic areas (Ireland, the small stretch of the Columbia Gorge where BPA’s wind is deployed, and Southeastern Australia) and simply linearly scaling up the total greatly underestimates the true geographic diversity of a much larger amount of wind deployed over a larger geographic area (see http://www.nrel.gov/docs/fy04osti/36551.pdf for the surprising benefits of geographic diversity for wind). For more representative datasets, you might start with wind production numbers for larger regions with larger amounts of wind, such as for Spain or for the U.S. Midwest ISO region (https://demanda.ree.es/eolicaEng.html , https://www.midwestiso.org/MarketsOperations/RealTimeMarketData/Pages/RealTimeWindGeneration.aspx) and then scale them up while statistically accounting for the additional diversity you’d get from deploying more wind. Or even better yet, you could use the datasets developed as part of NREL’s Eastern and Western Wind Integration Studies in the U.S.: http://www.nrel.gov/wind/integrationdatasets/eastern/methodology.html, which were expressly designed to study such high wind penetrations. Similarly, as others have pointed out, picking a few solar sites and linearly scaling up the data misses the great deal of diversity that occurs among geographically distributed solar arrays in the real world. “From the perspective of someone interested in reducing the use of fossil fuels and the negative externalities associated with their use…” I suggest that intention would be more meaningful if one realized energy concerns are paramount for health and well-being, and affordability, allowing scalability – which does require capacity concerns to be extremely relevant. The intent of introducing renewables is not necessarily, or even probably, to reduce emissions, but to displace nuclear. With a wind fleet capacity equal to average demand levels, most of the world would see about 25% of their supply from wind IF, and only IF, they did not have any baseload plant. This idea that ‘just 20% renewables’ as a target is a ruse. When intermittents replace nuclear baseload emissions will rise, and intermittents cause oversupply, when combined with nuclear baseload, at very low levels in the supply mis. The idea that we’d have 5 or 6 times average capacity, where wind and solar are pursued, is not made clear in these cost competitive fantasies thrown about. Michael, the problem I see with your arguments is that a system designed along your ideas is either going to have rolling blackouts if there is not sufficient storage or the cost of energy is going to be too high if sufficient storage is included to provide reliability. I don’t see an economical storage solution at this time. Scott Luft — However, Siegmar Gabriel is simply wrong. What is correct is that wind power raises the cost of electricity on a grid (largely) composed of NPPs. The situation for solar is more complex and I’ve yet to produce a completely satisfying analysis. It betrays what I can only assume to be a deliberate obfuscation of the economics of power production. Or an astounding ignorance of that topic. “Capacity concerns” cannot be ignored, because the capital investment demanded for a given level of power production is a function of installed capacity – and the ability to fund that investment is a function of production (i.e. capacity * capacity factor). That’s especially the case for a power production technology who’s costs are dominated by capital and financing costs – as is the case of wind and solar. For wind, your european equivalents estimate the O&M costs constitute about 20- 25% of the cost of a unit of production, meaning that capital and financing is 75-80%. Even if you were to assume that O&M costs were 50% variable – which is optimistic – it means fixed costs dominate. In that case, a fall in capacity factor from (say) 30% to 20% due to rejection of overproduction against demand- entirely probable in the sort of renewables-dominated grid under discussion – the unit price will rise by about 38%. And fossil plant is not fixed-cost free; for CCGT plant, fuel is around 75% of unit cost. Fixed costs still have to be recovered. Jani-Petri, thanks for the article, and especially Michael Goggin, thanks for the comment. EL, I appreciate the links to the studies you’ve provided. Michael, would you care to comment further on one puzzling fact I’ve been trying to find an explanation for – namely, the emission intensity of Navarre, Spain? This region of about 600 000 people gets over 70% of their electricity from wind power, AND the region houses about half of Spanish solar generating capacity. As you say, it is a remarkable achievement. However, contrary to your claims that such an achievement “would cut electric sector fossil fuel use and the associated harmful emissions of pollutants like carbon dioxide, mercury, sulfur dioxide, nitrogen oxides, etc. by a factor of three or more,” the actual emissions don’t show the slightest inclination to agree with your theory here. One can, of course, argue that Navarre isn’t a representative case study. I disagree, given it’s a sizable if smallish region with real industries and connected to a broader grid in a manner envisioned to Central European countries with higher wind penetration. Furthermore, the experience parallels that of Denmark, whose emission reductions have been, frankly, pathetic (and according to my sources, are more due to improvements in building efficiencies and the replacement of older coal plants by modern CHP plants). In short, while your theory is attractive, empirical evidence seems to contradict it. Of course, I may be wrong. I would be delighted if someone could point out the errors here. Key: Espanja = Spain, Maailma = the world. Red horizontal line: 2010 Kyoto goals for Spain. @Michael Goggin: First of all an energy infrastructure dependent on fossil fuels is presumably the thing that we should be getting rid of. Right? Second, you cannot assume that this infrastructure just appears out of nowhere without someone having to pay for and maintain it. If the idea is to just generate more and more electricity with erratic sources even if that lowers the capacity factors, the costs escalate since those are inversely proportional to the capacity factors. Anyone who wants to save money (for childrens cancer treatment, say) will save money by increasing the capacity factors of all those powerplants burning fossil fuels. No one builds those things without the intent of actually using them…unless of course sufficiently high subsidies are paid. @EL: You are right that Arcata is not the most optimal site. The CF suggested by the insolation data for Arcata is around 16% as opposed to Fresno Yosemite Airport which suggests a figure around 21%. However, I choose not to cherrypick data and since the average amounts to about 20% capacity factor, you cannot improve on that much. “Presumably, we’re interested in the modeling of real world systems, and assessing the performance of intermittent resources (such as wind and solar). ” No, real world system emit massive amounts of CO2 and we have to get rid of them. Not tinker them on the edges. Thanks for the citations.Denholm and Margolis seem to find similar things as I did. As soon as the solar fraction becomes substantial, more of it has to be cast aside and costs increase. Heide et al. quote a figure of 12-15% for the storage requirements in a fully solar+wind system which is pretty close to the figures I have quoted. (They also give it as a fraction of annual production. )Nice to see that my simple estimates are not too much off the mark. Heide et al. also manage to lower the storage requirements by massive overbuilding of capacity. This will naturally work, but implies large cost increases in all the extra infrastructure. Nikolakakis et al. also found that pv+wind systems have escalating integration issues as soon as their share becomes substantial. If it doesn’t become substantial, then CO2 emissions are way too high…at least for those whose primary interest is getting the climate change under control. I am not sure, if you have actually mentioned climate change in any of your comments. Maybe you have and I have missed them. Cyril R @ 9:32: That link to the German PV production is fantastic! Just for grins I took a look at high summer and high winter. If you look at the week including December 21 you can readily understand why solar will require virtually 100% peak capacity backup. As for wind, if any of those days coincided with little or no wind over large areas (which of course is a definite probability), then nothing more need be said about the need for full baseload backup. I wonder if there’s a similar site for wind production? Or better yet, for both together. What’s the best match for this type of demand, fairly constant baseload grid? Wind, or nuclear? (Deleted inflammatory remark) No one offers a plan for 100% wind and solar because they realize it’s not possible. This is exactly what we here at BNC worry about – that we won’t be able to power countries with wind and solar and will in stead get a largely fossil powered grid with solar and wind for good measure (or greenwashing, to be more accurate). Meanwhile plans are being pushed for 20% wind and/or solar, while no one talks about the more important 80%. Most countries have plans for 10-20% wind and solar, while they deliberately push off any discussion beyond that, saying the technology will improve, blah blah. Meanwhile CO2 emissions keep going up, not down. The problem is getting bigger while everyone is getting more complacent with their fancy solar panels and wind turbines. It is a stark contrast that I continue to be flabbergasted about. It does not make sense that raising the percentage of low carbon electricity generation should raise CO2 emissions. The solution to this mystery is found in Figure 13 of your reference. While renewable sources have a large share of electricity generation, the percentage of renewable in the whole energy system is still rather low. Under the circumstances, an increase of 86% is just about to be expected if you double your final energy consumption between 1990 and 2006. It is actually a slightly better record than 1990 if you look at CO2 per unit of energy consumed. Where in the paper do they say that this 86% increase comes from firing gas plants as backup for wind? Clearly Michael Goggin was not discussing cost at the line you quoted (he does discuss that in a later paragraph). It is also clearly irrelevant for the amount of CO2 avoided by wind that the generation is intermittent. Whatever low carbon generation replaces fossil fuel avoids CO2 emissions. No one offers any real world plans to go with solar and wind only? That would make the analysis in the post above irrelevant for real life situations. Again, almost everywhere renewable is massively dominated by hydro, a non intermittent source (reference at post above). They do have a biofuel component of 170 GWh per year, with wind at 630 GWh providing the biggest share and solar another 180 GWh. And they will keep their diesel generators for a rainy day, but as explained above, that is still massive progress compared to a system based only on burning diesel. Storage is supposed to be handled by batteries. A major reason for this is the astounding economic development opportunities wind and renewable energy development have brought to the region. Unemployment was reduced from 12.8% in 1994 to 5% in 2007 (here). An earlier study from Faulin speaks to these many jobs and economic windfalls (a central feature of Navarre’s energy strategy). Annual GDP growth has been in excess of 5%, and along with it large increases in energy consumption. Faulin notes in his studies the gains of renewable energy in reducing fossil fuel use and emissions (when measured against growth rates in other regions). Rising primary energy use, as you note, is also a significant factor. This appears to be a success story, rather than a dismal tale. Although someone really should tell the Spanish about the benefits of conservation and efficiency, especially when matched with renewable energy development as a major feature of their industrial and economic policy. “The situation in Navarre is characterized by a high consumption of energy per unit of the GDP in comparison with the rest of Spain” (p. 1791). So EL, your logic is as follows. 1. Throw subsidies at improductive marginal energy sources with the purpose of reducing emissions. 2. Create lots of synthetic extra jobs due to the excessive subsidies several times market rates, stimulating the synthetic (extra) jobs that burden the rest of the economy. 3. In the process create lots of secondary emissions from the synthetic economic growth, making the emissions worse than you started out with. This logic not only promotes inefficiency and creates increased inequality income by subsidizing rich people’s solar and wind , it defeats the very goal you started out with (reducing emissions). Reduced overall economic competitiveness of Spain, increased use of natural resources to build marginal energy sources without displacing a single fossil generator, increased income inequality, increased emissions. Karl-Friedrich Lenz, EL, thank you for your comments. This issue has genuinely puzzled me before. Re-reading the article, I note that I made a mistake in figures: the correct wind power penetration seems to be around 51%: the total electricity generation from renewable sources was about 70% in 2006, with wind accounting for 74% of that (e.g. pp. 50-51). My apologies, but I don’t think this has any significant impact to my conclusions. As a conclusion, it can be said that an important increase in the renewable energies use has been associated to a greater increase of the use of non-renewable energies, making Navarre a region in a difficult situation according to the sustainability standards. The positive effects of the development of renewables have been the structural changes performed to substitute final energies sources. Nonetheless, those changes have been compensated by the increase of final energy consumption and during the subperiod 2003-2006 those positive transformation effects have disappeared. The primary “take-away” of Faulin’s study to me seems to be that even aggressive renewable electricity programs are not very efficient in reducing emissions, unless energy use can also be kept constant. Furthermore, a 70% renewable energy penetration in electricity network seems to do little, by itself, to curb carbon emissions. …the implementation of renewable energy in Navarre has involved some effects of lower increase of the pollutant gases emissions, but not in the expected quantity. Furthermore, the renewable energies have not been revealed as substitutive energies to the traditional and non-sustainable ones, albeit they have increased the awareness of doing so in the nearby future. It’s great that the renewables program has brought new prosperity to the region. It’s also great that they have increased the “awareness” of replacing unsustainable energy sources, although I’m a bit wary of such weasel words. Nevertheless, the program hasn’t managed even to keep the emissions in check, much less reduce them. I’m in this game to reduce harmful emissions, and while I’d like to do so while simultaneously increasing prosperity, emission reductions are to me the more important goal. The renewable revolution in Navarre hasn’t substituted for dirtier energy, it has simply added to it. If the logic proposed by EL is sound, I probably should be strongly opposing renewables deployment, as it seems to increase the total economic activity and unsustainable growth rate while doing very little for the environment. Certainly, the “bang for the buck” seems to be rather small. I’m happy to be proven wrong in the future, but as it stands, the contrast to the French experience is stark. Somehow, they managed to accommodate rising energy use with greatly lowered CO2 emissions, although of course the increase in energy use was not as radical. Yes, this is the most significant take-away from this study, and is one emphasized in many others. I have many of the same problems with nuclear. We don’t make any meaningful headway simply tacking on new generation sources to a failing energy system, no matter how clean or efficient (and give no attention to consumption, conservation, transmission and delivery, or efficiency). This is one of the main conclusions from the following study, recently published in Science, looking at four possible technology pathways to achieve deep GHG reductions in California. Staging matters, as does a comprehensive approach to energy development. France has one of the worst records on conservation, efficiency, or energy use per capita, and nuclear has a great deal to do it it. So apparently, we’re going to need a lot more than simply a decarbonized grid (whether it’s nuclear, renewables, CCS, or anything else). France has one of the worst records on conservation, efficiency, or energy use per capita, and nuclear has a great deal to do it it. In other words, nuclear is so good that its massive roll-out has dropped the per capita emissions of a wealthy OECD nation below Chinese levels, even when coupled with massively inefficient energy sector and increase in final energy use. Is that what you say? I’d say France is among the only real success stories around, as I would imagine that when tighter conservation and efficiency measures are eventually introduced, the French emissions will be lower still. As far as I’m aware, their emissions are on a downward sloping trend. (Unless they make an U-turn about nuclear.) Sweden, our dear neighbor, is another good example: they’re apparently quite energy efficient, and when coupled with over 90% electricity coming from nuclear and hydro, they manage with even lower per capita emissions than do the French, and, again, beat the Chinese quite handily. Which is far more than any country relying on renewables and efficiency can say, so far. Regarding Navarre, I only say that with a few more successes like that, we will be done for. Otherwise, I’m in full agreement. We must also give attention to consumption, conservation, transmission, delivery, efficiency, and phaseout of fossil fuels in transportation, among other things. That much is self-evident. However, given the empirical evidence, I fail to see renewables playing a major role in the effort. So, if I follow you correctly, you’re now arguing that wind and solar’s inability to supply electricity effectively, reliably and economically is a virtue – because it enforces a constraint on other activities? Yes, if energy consumption rises faster than our ability to replace carbon emitting sources of energy, we have a problem. Hence, the consensus among everybody who has looked at this issue to see conservation and efficiency as a fundamental concern. Looking at the IEA figures on per capita energy usage France uses less than Belgium, the Netherlands, Sweden and Luxembourg, and about 2-03% more than Germany. So, no great evidence that France is especially profligate there. The comparitive CO2 figures look interesting, though. France produces about 6.1 tonnes per capita, Denmark (with all those windfarms, and about 10% less energy use per capita) 8.4, Germany (with all those solar panels and windfarms) 9.6. So, it’s look as though that decarbonised grid can take you a long way, and that France isn’t exactly a “stand out” in terms of undue energy usage. Come on … you had me hanging on every word until you drew on China for our performance measure of success. With 80% generation from coal, and over half the population maintaining a rural lifestyle, I hazard to guess what just 10 more years will do to global emissions and consumption levels. We’ve all seen the charts, China will not be able to keep it’s emissions levels in check at current rates of growth and with ambitious deployments of nuclear. In fact, the two go hand in hand. Their current every reactor design under the sun technology strategy has more to do with competitive market advantage (vis a vis South Korea) than it has to do with climate mitigation goals. We have some serious challenges ahead of us, and unless we get busy on them humans might yet prove to the Darwin Finches we are the least adaptive species on the planet. I would hope Navarre reaches a plateau of full employment, energy decarbonization, and local resource sustainability … all with very high measures of quality of life, health longevity, energy conservation and efficiency, economic competitiveness, and more … and without any of the headaches of an “endless consumption” paradigm offered by coal or nuclear power. It’s a challenge, but someone has to prove to the Darwin Finches that humans (with our recently evolved and highly differentiated neocortex) are able to forego the short term payoff for the long term gain. I’m a huge proponent of change, but life as we know it depends on it (and some important legacies from human history are definitely worth keeping and making a bulwark of our long-term environmental strategies). If you see natural resource availability as unconstrained, let’s go for nuclear, otherwise I’m crossing my fingers wiser heads prevail. I doubt our earlier commenter from the AWEA would be best pleased with you for making that point! “The country’s electricity consumption per capita is significantly higher than the European average due to the high penetration of electric heating (7,250 kWh in 2009, compared with 5,650 kWh in the EU). The share of electricity in final energy consumption is increasing steadily and reached 23 percent in 2009 (compared with 18 percent in 1990). The country’s electricity demand has been increasing relatively rapidly: almost 2 percent / year on average since 1990 and over 1 percent / year since 2000″ (p. 2). The only thing that appears to have made any real difference are policy instruments, namely emissions trading schemes as described in the report. EL, I wasn’t using China as any success measure. Simply pointing to the fact that at least two rich-world countries with quite high per capita incomes and associated consumption patterns have actually managed to stay below current Chinese per capita emission levels. Sadly, the trend in China is rising – while the trend in France and Sweden is falling. Despite the increasing electricity demands! One can also compare and contrast France and Sweden to Germany and Denmark, both of which see their emissions stay quite stubbornly at about 50% higher than their neighbors. To me, it seems that France and Sweden are that much closer to the goal of zero-carbon society than Germany and Denmark. I agree that conservation and efficiency are very, very important. But I’m confused a bit here: you quote the French figures of increasing energy consumption, while their per capita CO2 emissions are below developing country levels and going down even further. Doesn’t that disprove your claim, in part? It looks like that electricity consumption, at least, can rise, while emissions can still go down? Were every country as CO2 free as France, we basically wouldn’t have the climate problem we now have. At least, it wouldn’t be as pressing! I too hope that the humankind sees the error of its ways and we get somehow out from the growth paradigm (although historical examples make me somewhat concerned about long-term social dynamics in zero-growth societies). However, I also think we need to do more than hope. In particular, we need to lower our CO2 emissions, as much as we can. And from the evidence, it seems to me that the only countries that have actually succeeded in significantly lowering per capita CO2 emissions are those which have significant hydro and/or nuclear power. If renewables can help, that’s great, but I wouldn’t bet the farm based on the evidence so far. You’re confusing electricity consumption with overall energy use….and one of the things that has to be done to reduce carbon output is to shift energy use from carbon-producing technologies to low-carbon ones. And that usually involves electrification, and a low-carbon grid. So, for example, if I move from a gas-fired boiler (as I have at the moment) to electric storage heaters, on a mainly nuclear grid like France’s, my overall energy use will be similar (net heat production will increase over the whole system), my electricity usage will increase, and carbon output will reduce. Your logic is getting tangled here – you seem to be arguing against the use of nuclear (which you’ve acknowledged is an effective low-carbon electricity production technology) on the grounds that it will somehow make it more problematic to replace crabon producing electricity production? The reason France’s carbon out put is so “high”, high as it is, that is, has to do with the high use of transportation fuels. Obviously their nuclear grid is responsible for the *lowest* aspect of their carbon footprint. The French drive a lot with an increasing number of bedroom communities surrounding their largest cities and *not* tied to their historically very effective regional rail transport. It seems EL is simply frustrated that France’s nuclear grid has generally not caused a *decrease* in electrical use. My response is: “Good!”. They don’t really need to conserve their electricity usage as much as coal/wind strapped Germany or high gas use Denmark because France’s power is mostly carbon-free. This is why it IS an example: people can (and should) use more energy to make life easier. This is what the developing world is looking at. EL has given an interesting and positive example (France) for the developing world to go nuclear: to use more energy per capita without effecting climate change! And when we move to decarbonise transport, it’ll be by moving to EVs and high speed rail. Which increases electricity usage. And when we decarbonise domestic and commercial space heating, it’ll be by moving to storage heating, GSHPs, and air-source heat pumps instead of gas or oil burning. Which increases electricity usage. And when we reduce carbon intensity in industry, it’ll be by meas of things like RF heating – which will increase electricity usage. This puts rather a premium on large volume, reliable low-carbon electricity production. You can’t stop a train because the wind’s dropped. You can’t get much january heating from solar PV. You can’t interrupt a pour of steel because it’s dark and still. So, any guesses what might work? 3) of the increased energy supply associated with economic growth less than half has come from wind and solar. The corollary is that nobody has achieved balanced economic growth via efficiency, wind and solar alone. That includes the 0% growth case. Even to get to a steady state economy from here based purely on wind and solar will require massive inputs from other energy sources. If carbon is a problem that leaves few options. Andy that’s good. I like your reasoning. This is what the developing world is looking at. EL has given an interesting and positive example (France) for the developing world to go nuclear: to use more energy per capita without effecting climate change! The California study is interesting in this respect, since it concludes that without significant efforts on conservation and efficiency … we’re going to be needing twice the level of new builds in generation capacity over 40 years, three times the transportation additions, and twice the storage capacity (which is a minimum regardless of generation option selected). We can’t even get a modest build on nuclear started (leaving out France’s efforts in the 70s), and we also have land, water, and natural resource limits to contend with. It doesn’t look good. And France still hasn’t paid off it’s massive debt from it’s nuclear build … despite very liberal pricing structures (which have driven high energy consumption rates), conversion to inefficient electric heating, dumping energy on export markets, and state backing of public utilities (regarding financing, insurance, bankruptcy protection, ownership, etc.). If this is the one example, and they can’t find their way back to the black, I don’t really see how this is a viable or strategic option for other countries (or leaves much room for private sector involvement … which appears to be doing quite well when it comes to renewables). Add to this low public acceptance, and inadequate solutions for waste storage (if only 400 years for IFR), I really start to see many challenges adding up (and all options have trade-offs, and are by definition imperfect). If expensive storage is the only thing that stands in the way of deep GHG reduction cuts built on a backbone of renewable energy technologies (that can be deployed anywhere regardless of political, economic, or central government planning and institutional capacity requirements) … I’d say let’s get started. If we’re waiting to have all of our ducks in a row for nuclear (capital, waste storage, advanced reactor designs, fuel cycle development, regulatory reform, central planning pre-requisites, private sector involvement, public acceptance, and more) … it seems to me we’re going to be waiting a very long time. And one constructive example in France (despite energy conservation and debt financing obstacles) does not a global strategy make! If Sweden made better choices, they did so with an abundance of natural resources (and a great deal of sustainable hydro and bio-fuel) on their side. They also did not turn their backs on energy conservation and efficiency. To answer the questions about Navarre’s and Spain’s experience with wind and other renewables reducing emissions, I pulled the relevant data for Spain from the US EIA, available here: http://www.eia.gov/cfapps/ipdbproject/IEDIndex3.cfm?tid=6&pid=29&aid=12 Looking at data for Navarre alone wouldn’t be useful since the Spanish power system is operated as an integrated whole (i.e., looking at Navarre alone would miss whether renewable electricity produced in Navarre is offsetting fossil generation elsewhere in Spain), and from a climate change perspective it doesn’t matter where in Spain the CO2 emissions were emitted. The data for Spain shows a remarkable success story of wind and solar energy drastically cutting Spain’s fossil fuel use and emissions. In 2005, Spain emitted 150.5 million metric tons of CO2 from the consumption of coal and natural gas, based on data tracking the amount of coal and natural gas consumed in the country. Electricity production from wind steadily grew from 20.1 billion kwh in 2005 to 34.8 billion kwh in 2009. Hydroelectric output also increased as a result of 2005 being a poor water year, going from 17.7 billion kwh in 2005 to 26.0 billion kwh in 2009. Total electricity generation in Spain was flat over this time period, with 272.1 billion kwh produced in 2005 and 275.1 billion kwh produced in 2009. So wind grew from providing 7.4% of the country’s electricity in 2005 to 12.6% in 2009, while hydroelectric increased from 6.5% to 9.5%. Solar also helped out by growing from almost zero output in 2005 to 5.8 billion kwh in 2009. As a result of the increase in the output from these renewables, Spain’s coal and natural gas CO2 emissions fell from 150.5 million metric tons in 2005 to 117.1 million metric tons in 2009, a decline of 22% over just four years. Spain became a net exporter of electricity over that time period, going from exporting 1.3 billion kwh in 2005 to 8.1 billion kwh in 2009, so one can’t argue that an increased reliance on imports allowed Spain to keep its emissions low. The coal and natural gas emissions data do include emissions from coal and natural gas used for other purposes, such as home heating and industry, so it is true that these data are not perfect indicators of what has happened in the electric sector. Since the use of fossil fuels for home heating is likely to have increased over this time period while industrial use of these fuels has likely decreased, those outside factors are likely to roughly cancel each other out. If anyone has purely electric sector data it would be helpful to have it, although it is extremely unlikely that changes in non-electric use of these fuels would be drastic enough to account for all of the observed decline in CO2 emissions. If one wants to remove the impact variability in hydroelectric output may have on the results, one can use 2006 as the base year, since 2006 and 2009 had nearly identical hydroelectric output. With 2006 as the base year, wind output increased from 22.1 billion kwh to 34.8 billion kwh, growing from 7.9% of electricity generation to 12.6% of electricity generation. CO2 emissions fell from 144.6 million metric tons in 2006 to 117.1 million metric tons in 2009, a decline of 19%. Please analyze the data on your own and tell me if you can draw any other conclusion than that wind and solar energy have allowed Spain to drastically reduce its use of fossil fuels and its CO2 emissions. With 10 billion people on the way, feeding the planet will require energy-intensive agriculture. Conservation can only supply some of that; demand for energy will increase, there’s no doubt. Fossil fuel use must be curtailed. There’s only one sane conclusion. While Cyril R. gives some reasons (I don’t agree with) about why there are no plans based on solar and wind only, he doesn’t seem to dispute the fact that there are none. That confirms my point that the above post is not relevant for real life scenarios and rather only theoretical speculation. Again, in real life renewable energy is massively dominated by the largest low carbon source, hydro (reference given above). I would also like to hear opinions on whether the plan by Lynas and Goodwin I mentioned would work. If so, that would seem to contradict the basic idea of the post above that a system mainly based on solar and wind can’t possibly add up. Michael Goggin: Thank you very much for your response. I take you at your word, and as you say, the conclusion seems to be more optimistic than my original. Which is eminently good news! However, I wouldn’t entirely discount the Navarrese (?) experience. The paper I quoted above did study the substitution effect and emission savings of renewable energy, and if I understood the paper correctly, found they lagged behind expectations. Given high expectations placed on renewables, that might be expected :). My conclusions about the effectiveness of renewables in actually reducing emissions is influenced by the Danish example as well. Is anyone aware of detailed studies that have disentangled the achieved emissions savings and their sources? I’ve heard before that much of the savings may be ascribed to increased use of CHP and better efficiency measures, but haven’t seen a study to confirm these claims. @Michael Goggin: It is nice to be optimistic, but I am a bit sceptical of how you inteprete the figures. So your claim is that 28.8 billion kWh of extra renewables production lowered emissions by 33.4 million tons. I.e. that each kWh of wind, hydro, or solar avoids 1160 g of CO2. 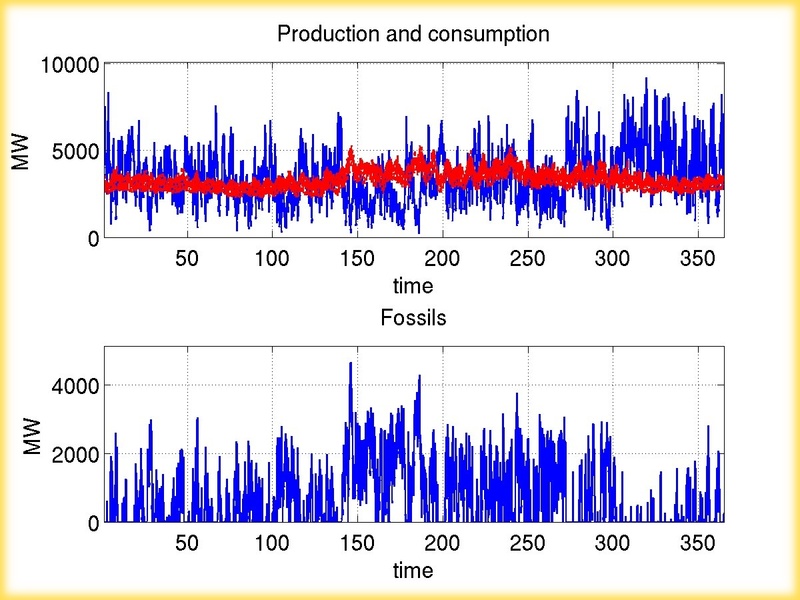 This figure does not correspond to the CO2 intensity of spanish electricity production. From https://demanda.ree.es/demandaEng.html I can check the figures currently. 02.12.2011 at 0740am emissions rate was 264 g/kWh. Yesterday at around 2100 when consumption was higher the rate was about 320 g/kWh. So you are assigning to renewables in Spain far higher emissions reductions than appear reasonable. Maybe you could clarify how that more than 1kg/kwh emission avoidance appears? Assuming that nothing special has happened outside the electricity sector in the past few years in Spain is also rather risky. Spain had a housing boom which ended in a bust just during the period you quote. Making a quick search (http://mpra.ub.uni-muenchen.de/24464/2/MPRA_paper_24464.pdf) I find that Spain was producing 54mtons of concrete before the bust and (http://www.oficemen.com/noticia.asp?id_rep=768) just around 27 mtons at 2009.If 0.9 tons of CO2 is emitted for each ton of concrete (http://en.wikipedia.org/wiki/Concrete#Carbon_dioxide_emissions_and_climate_change) this reduction in concrete production could account for more than 20 mtons of CO2. I do not know what fraction of spanish concrete is imported etc. but ignoring the financial crises and housing busts while doing these estimates makes numbers appear better than they probably are. Your remarks on EDF not having paid its debt from the 70-80s nuclear splurge do not appear to withstand scrutiny. Following the link you give, the only debt data point is for 1989, some 22 years ago. for the record, a debt of 800G FF ammounts to 120 G€ today. But right now, EDF debt is 29G€ after having gone on a shopping spree in the 2000s (Italy & UK) (source: http://finance.edf.com/espace-obligataire/structure-financiere-40674.html ). You take issue with public ownership of EDF. Well, it’s not to build nuclear plants that it was nationalized in 1945, but more because of the sorry state of facilities following WWII. You also say that electric heating is inefficient. Well, if you take the latest gas boiler for home use, you should get north of 80% efficiency. But the installed gas boilers in France are closer to 60% with still some constantly burning gas for the starter. If you take a CCGT, you should get 50-60% of efficiency to electricity, the grid is more than 90% efficient for transmission, it does not look so bad already for heating. And if you throw in electricity coming for more than 80% from nuclear & hydro, it begins to look very good from a carbon emissions point of view. And by the way, housing heated by electricity is generally better isolated (because it’s a more recent building). If you’re looking for some more energy efficiency, you can go for heat pumps. As far as I know, most heat pumps run on electricity. More to the point, with electricity you can get rid of most carbon emissions for heating. When burning things, it’s very hard to get rid of fossil fuels. As for the post, certainly it is very hard to smooth the variations of solar & wind. While solar PV is correlated with electricity demand in places close to the tropics (because of air conditionning), wind is not correlated with demand anywhere. And looking on how it’s done in Denmark, Germany of Spain, we’ll get stuck with a 2 to 1 ratio of electricity made from fossil fuels compared to wind+solar generation. That’s not enough to avert climate change. The battery that we need is about 12-15 tonnes of lead per capita. That’s about ten medium sized cars per person!!! And that’s just for the lead, not the entire battery, which would weigh in at at least 30 tonnes per capita. This is simply insane, and even then one week of energy storage isn’t enough, if you have two weeks of low wind speeds in winter the entire nation shuts down. This isn’t anywhere as reliable as today’s electric grids. Yet this issue is very much relevant and not theoretical in the sense that we need to cut CO2 emissions to a tenth today’s levels at a time when they are growing (economic growth around the world). Sadly, wind and solar are being used as an excuse of complacency – namely, to not have to build as many nuclear plants as we can. Like David Mackay said, we need a plan that adds up. A plan for 20% wind, 10% solar and 70% mostly fossil backup isn’t acceptable. It is a dangerous delusion, a fossil fuel lock in. I therefore contend, that it is very much relevant to discuss close to 100% solutions, at the very least for that portion which is ‘easy’ to do, such as electric commuter car travel, heat pump heating, etc. The italics is still on. Somebody forgot to close it. @Cyril: My thoughts exactly. I am not aware of any national scenario which adds up to kind of GHG reductions we need. There is plenty of talk and percentages thrown around without any meaningful policy framework to back those numbers up. Of course nobody who understands energy production/consumption even a bit sees 100% sun or solar scenarios doable, but those are very much the reasons many people use to justify anti-nuclear opinions while still clinging to an idea that they are serious about climate change. If we need to have about 100% backup for wind and solar, what adds up? Hydro doesn’t do it, biomass doesn’t do it and is ecologically crazy (human appropriation of primary production is the biggest driver of extenctions already), wave power for sure doesn’t do it (and even if it did how would you change the output power to smooth out wind or solar output? ), geothermal gradient is too weak in most places. In theory you might mine for heat if you are ready to drill several kilometers into the rocks, but even if feasible would you run such a powerplant to smooth variation in windpower production? If so, why? The point is that public THINKS there is this all renewable energy systems around the corner that do add up. Public is unfortunately mostly ignorant and this ignorance has serious political and environmental consequences. As far as I can see, the only way solar and wind power based solutions can work is if they are small pieces of massive energy infrastructure based on fossil fuels or nuclear power. And if the nuclear taboo is lifted, soon someone asks that given nuclear why would we need solar and wind at all, except perhaps in some off-grid applications? I suspect that this one reason for anti-nuclear opinions. Many people have become so ideologically committed to wind and solar, that they need the nuclear taboo. I am not aware of any national scenario which adds up to kind of GHG reductions we need. There is plenty of talk and percentages thrown around without any meaningful policy framework to back those numbers up. Of course nobody who understands energy production/consumption even a bit sees 100% sun or solar scenarios doable, but those are very much the reasons many people use to justify anti-nuclear opinions while still clinging to an idea that they are serious about climate change. If you have already made up your mind this can’t be done (just 5 or 10 years into the process of building up wind and solar to scale in many locations), why spend any time chasing your own tail or providing roughshod estimates about preconceptions you already hold and clearly motivate your research questions? It is pretty astounding to me the ease at which anybody dismisses 10% or even 15% contribution from wind and solar, which is a massive amount of entirely sustainable, carbon free, and waste free source of energy in very robust national energy markets. Thankfully, seasoned researchers in this field are not so easily dissuaded by the results obtained so far (notably without storage), and see a great deal of development potential to meet significant carbon reduction goals in the future (and on a economic and reliable basis). There is really no shortage of this stuff to look at in the scientific or trade literature. Michael Goggin has provided links to some of it. Here are two more. “Technology mix alternatives with high shares of wind power and photovoltaics—case study for Spain,” Energy Policy, 2011, 39(12), 8070-8077, Ghassan Zubi. High shares in this instance means 15% from solar and 30% from wind … with various capacity reserves coming from inflexible baseload plants, CCGT, or open cycle gas turbines. Degree percentages would likely change with energy storage as an option (not examined in study). Instead, economic feasibility and system reliability are major concerns. Hourly demand data are used from Spanish Electricity Market Operator. What are the results: “power mix options with a high wind plus PV share are feasible with acceptable costs” (p. 8075). Average cost range of wind power “is similar to that of baseload power for 2020 and 2030” (p. 8075) and LCOE cost estimates for combined renewable energy mix range from a low €6.8 cents/kWh to a high €7.9 cents/kWh (depending on how much wind is curtailed in power management). With storage, curtailment would not be necessary at 2, 5, or 10% share of combined energy mix as modeled in study. In case you’re not adding up these numbers, thats 45% total energy share from renewables on a feasible and economic basis (with no use of storage). “The use of cost-generation curves for the analysis of wind electricity costs in Spain,” Applied Energy, 2011, 99(3), 733-740, Norberto Fueyo, et. al. And what is the on-shore resource potential for wind and levelized cost of this energy if supplied on a reliable basis to the Spanish grid? Contributing up to a 33% resource mix, and with capacity factors in range of 19-35%, cost of energy starts at €4 cents/kWh, and averages €8.5 cents/kWh, with an estimated on-shore resource potential of 300 TWh/y (“roughly equal to the overall demand in Spain in 2008). What’s not to like? When reliability, sustainability, competitive costs, zero emissions, zero waste, economic and jobs benefits, ease of deployment, resource independence and security, and more start to line up … I think it would be entirely irrational not to see wind (or a high wind and solar mix) as a substantial part of a global technology pathway to deep GHG reductions. At lot of the material presented in the lead article starts to sound like AGW skepticism to me, especially when so poorly research, being highly motivated in the outcome, and showing an inadequate consideration of the literature (re: problems areas in research and consensus). Your remarks on EDF not having paid its debt from the 70-80s nuclear splurge do not appear to withstand scrutiny. There is absolutely no confusion about the source and long term basis of the EDF’s debt. They currently have a very low P/E ratio, with debt nearly matching assets and revenues. And this picture is substantially improved, as you point out, with recent large asset sales, such as EnBW at $7 billion. Various nuclear trade publications and websites have been covering this issue for some time (describing EDF as “the most debt-laden traded company in France”). Without strong public government backing and support (the government’s ownership share currently stands at 85%), I have no idea how they would survive as a private company. you don’t know what you’re talking about. EDF is not the most indebted firm in France. Here’s the proof: FranceTelecom is more indebted. The cash flow / debt has nose dived in last five years. As for the P/E ratio, it’s about 10 for the whole Paris market. You might have heard of some crisis of the euro. The political context in France does not help also. But you should know that the share price plummets when there is talk of lowering nuclear’s share of production. As for survival without state backing, a lot of utilities have a high debt/cash flow ratio, because they work on long term contracts. You might also be aware of something named the European Commission which stricly curtails what help a state can give to state owned firms in the name of competition. Here’s a rare 300 MW wind farm proposal that claims it does not need gas backup, REC type subsidies or new major transmission lines. The reason is that it will have a short connector to an existing hydro substation and the outputs from wind and hydro will be offset. Nonetheless in a drought and still air heatwave I’d imagine that gas generators elsewhere on the grid would assume the load. Conveniently side-by-side reliables and unreliables must be the exception. By mid century we must assume that gas will be too expensive for the backup role. Japan seems to be recoiling from the cost of generation powered by spot price LNG. Fast forward a couple of decades and I think we will see the same horror at the cost of balancing wind and solar using gas. Any displacement of gas won’t be enough to justify the combined cost. However we’ll also need a non-gas alternative for peaking power. So we all agree that having 100% wind and solar systems destabilizing our grid will not happen in the real world any time soon. Again, then why bother analyzing the stability of the grid in such a system? Actually, I wish we had that problem everywhere already. If the Maldives plan by Lynas and Goodall referenced above were already completed, we might see that the biomass capacity is not sufficient in some situations and they need to use their diesel generators some of the time, which are kept under the plan. But that would still be a vast improvement over the starting point, which was generating everything from diesel. If you think there is some grid stability problem with “unreliables” at 100% solar and wind, when exactly does that kick in? Or the other way around, how much low carbon generation with “unreliables” are you prepared to allow? How many solar panels and wind turbines may the Maldives install before meeting with your opposition? Or is that opposition unconditional, “unreliables” are to be rejected at any level of penetration? On a related note, you might be amused finding out what is the number one result if you search on Google with the term “unreliables”. BNC Comments policy requires links/refs to support your contentions. Please provide them in future. I think the label “unreliables” is totally unprofessional and some what childish. @Karl: For me what few hundred thousand people in Maldives do is not important. They are scattered into many islands and the kind of solutions they would need are very different from those elsewhere. For all I care, they could continue burning diesel until some affordable zero carbon source comes available and spend the money so saved on health care, social security, protecting their environment etc. What Maledives does has more of a symbolic value. If they want to set an example, they should do something that actually removes all their emissions and does it in such a way that other countries can do it as well (i.e. that it scales from 300000 people to 7000000000). If they were to just cut they emissions 50% and then stop, they set a bad example. Whether they end up being 1m below waterline or 50cm is beside the point. They drown either way. When does my opposition to unreliables start? It starts from the first mW that is installed for ideological reasons with tax payer support without reasoned discussion. The same applies to all other sources of energy including nuclear. If all options are on the table (not true in most places) and we make sensible cost comparisons, environmental impact assesments etc. etc. and wind or solar comes on top, that is fine. But this is not how it is done today. Why on earth unreasoned decision making should be tolerated? Unreason might have its place in matters of love, but not on matters of energy production. @ Karl. What Jani said. Sure its great if you can replace a largely diesel island grid with some wind and solar and much less diesel. No one disputes this is an improvement of the situation. What we dispute is the actual CO2 – or even diesel – saved like this in a global perspective. Most diesel is used industrially, for transport etc. Only a tiny fraction is used for remote powering. Moreover, we currently use over 7 billion tonnes of coal every year, actually it is increasing rapidly to 8 billion tonnes as we speak. I want to do something about that growing coal problem. Looking at where coal is used, it is almost all in electric generation in large powerplants plus metal reduction (mostly iron and steel production). Those are industrial energy needs. Wind and solar do very little to get rid of the coal plants. Whereas nuclear power plants replace them 1:1 at vastly lower cost. posted 3 December 2011 at 8:36 PM by Cyril R.
Looks like we’re already around 8 billion tonnes of coal use globally, its worse than I thought. Brown coal is the dirtiest type of coal. The biggest brown coal user is, drumroll please… Germany! Germany is also the number 7 coal consumer in the world, and the 6th biggest coal importer. Germany gets 44% of its electricity from coal. Pretty depressing results, after spending >100 billion euros in guaranteed subsidies, favorable grid regulations (must buy), various tax breaks and low interest loans, and all sorts of efficiency and recycling efforts, they use just as much fossil fuel as they did 20 years ago (when they started seriously with wind and solar). That’s a great case study on the question, “solar and wind power combined – a way to get off of fossil fuels?”. posted 3 December 2011 at 10:18 PM by Cyril R.
It is no more unprofessional and childish than the label “renewables” which is boutique term of romantic, high quality, superiour and clean energy. When in fact it is not so high born at all. Biomass combustion, one of the so called “renewables” is one of the biggest causes of lung disease and lung mortality in Africa. It is also one of the premier causes of deforestation in much of Africa and in other developing countries. Way to go, “renewable”. The Three Gorges Dam displaced roughly a million people, who then had to “renew” their homes and livelihoods elsewhere. It also annihilated countless endemic species and in fact entire ecosystems. But hydroelectric is “renewable”. The sun is burning through hydrogen at many tonnes per second. This is hardly renewable, it is the opposite, hydrogen that is fused is lost forever, for all eternity. It doesn’t get any less renewable than this. When you fission actinides they also are gone forever, and the amount available is enough for millions of years just like the sun. Somehow though, fission is not considered “renewable”. Wind and solar use ten times as much concrete and metal as nuclear fission powerplants, per average Watt delivered. They also need tons of batteries or flywheels or pumped hydro equipment/materials to get to the same effective load carrying capacity as the nuclear plant. None of these minerals are “renewable” (fortunately they are recyclable so if we find enough and recycle well we can do fine). The term “renewable” is a catchphrase, a meaningless term. Like “sustainable” is also meaningless and thefore popular with everyone. It can mean anything you like. Unreliables is a far better term, because it is accurate. Wind and solar are non-dispatchable and this has to do with the resource, not the technology. So it is a robust statement. I guess one might argue that we can reliably predict that tonight’s solar output will be zero. That doesn’t solve the problem of meeting the load at night. I think “undependables” is a better term. “marginal sources of energy” is also good especially if you’re an economist you know full well what that implies. posted 3 December 2011 at 10:31 PM by Cyril R.
One of the problems with the “unreliables” label is that people using it may be either meaning only solar and wind (like the post above in the last paragraph) or all renewable generation methods (like the post above in the first paragraphs). That obviously confuses the discussion compared to using the normal terms of “renewable” and “intermittent”. I note that for the time being there is no answer to the question when exactly the problem of grid stability derived from installing solar and wind is supposed to kick in. What the Maldives do is very relevant, especially for your post. For one, they want to be the first country world wide to go completely carbon free in ten years. People will be able to look at their experience and find out what actually works in real life and what not. If you want to check how your theory developed in your post works out in real life, you need some place that actually tries to do what you are modeling. I also kind of like the idea of getting completely there in ten years. Other countries should take that as a starting point as well. And I chose that case because it is the closest to your theoretical scenario I could find. If it is not relevant, well, that would be the end of trying to find any real world relevance for your theoretical speculation. If you think that cutting emissions by 50% is meaningless, let’s just say I disagree. You need to get 50% done before you get 100%. And while I have no basis for rejecting or confirming your figure of 50%, I would be rather surprised if Lynas and Goodall were so far off with their plan. They sure said 100% carbon free (as opposed to getting only 100% of electricity generation carbon free). There is no confusion here. Biomass and biogas plants tend to be very reliable, as are hydro dams with big enough resevoirs. You can store biogas in a big atmospheric pressure tank for cooking your meal when you want to. You can store loads of water behind a dam and turn on the generator when you need to. It is not hard to look up that this is the case. By contrast, it is very difficult to understand what people mean by “renewable”. Innumerate nonsense coming from PV advocates is certainly renewable. Our global CO2 emissions are also renewable, they keep coming back every year. Some renewables have huge environmental and other external costs. Some renewables mean the end to rainforests, which is hardly renewable in terms of biodiversity. Some non-renewables are so absurdly large in resource that it is not relevant to say they aren’t renewable. Aluminium oxide for example (to make aluminium) is not renewable but it is so abundant that it isn’t relevant. These are just a few examples of the problems with the term “renewable”. The term “renewable” simply doesn’t convey any relevant message. It only serves advocacy and confusion. The term unreliable is very accurate and disambiguous. Intermittent isn’t entirely correct for PV since the output won’t suddenly drop to zero during the day, nor will it suddenly pop up in the night. Variable and uncontrollable (or not dispatchable) are more neutral terms we can probably agree on using. The terms “intermittent” and “renewable” are not at all useful to dig into the truth. posted 4 December 2011 at 4:33 AM by Cyril R.
careful about defintitions. Intermittent simply means available on a partial and interrupted basis over time. within the general category of intermittent we need to differentiate between unpredictable and predictable intermittentcy. Tidal power would be an example of the latter, wind an example of the former. However, on a grid management basis, and in terms of back-up the difference is less striking. Unpredictable intermittents need 100% backup dispatchable on short notice (sub-3 hours). Predictable intermittents need 100% backup, that is plannable more than 3 hours in advance. But both need massive back-up and redundancy – which usually implies gas. posted 4 December 2011 at 4:44 AM by Andy Dawson in reply to Cyril R.
Andy, predicting is only a small part of the solution. I can predict that tonight’s solar output will be zero. That doesn’t solve the problem, we need to keep the lights on at night and power industry, hospitals etc. or people will die, chaos will run free, and entire industries are damaged (ask a float glass manufacturer what happens to his manufacturing line if the power goes out all night). What we need is supply power when it is needed. Compared to that, predicting output is easy. Actually delivering it when your sun and wind are not there – which is 70 to 95% of the time – is much more difficult. Like you say, if you don’t have swathes of natural gas handy, it doesn’t look good for you. If you do have swathes of natural gas handy, it doesn’t look good for the climate. posted 4 December 2011 at 5:56 AM by Cyril R.
Cyril R. I agree – you should continue to use the term “unreliables”. The idealogical loading that this adds makes it clear where you are coming from. Like commenters who refer to climate scientists as “warmists” or “alarmists”. Karl-Friedrich Lenz — Grid stability questions arose just as soon as there was a grid. The traditional approaches were to design thermal and hydro genrators which could load follow the actual variation in demand. But with ‘must take’ generation from wind and solar, these two sources become negative load from the standpoint of stability, i.e., controllability. This can (and does) cause increased variability; that is, the rate of change of power required of the dispatchable generators. It has been noted that this is hard on that equipment, lessening service life. MikeH – so you are asserting that solar PV in germany, with a capacity factor of 0.09,is reliable? Where I am coming from is running the numbers, then concluding things based on those numbers. Sometimes numbers show that some plans are complete nonsense. You should be honest then and drop your ideologies, and draw the hard unpopular, but correct conclusions. posted 4 December 2011 at 6:31 PM by Cyril R.
I agree, Cyril – in fact, that was in large measure the point I was making. There’s a case in point here in the UK, with the proposals to build a very large scale tidal power barrage on the Severn Estuary. That scheme would cost something in the order of £20-30Bn ($32-48Bn). Its peak output – the number usually quoted by enthusiasts – would be around 10-11 GW, at the very highest spring tides, or 8-9GW at a average high tide. It’s average output would however be 1.8-2.0 GW. Its an “ebb flow” concept – incoming tides fill up the lagoon behind the barrage, and the flow is then released. 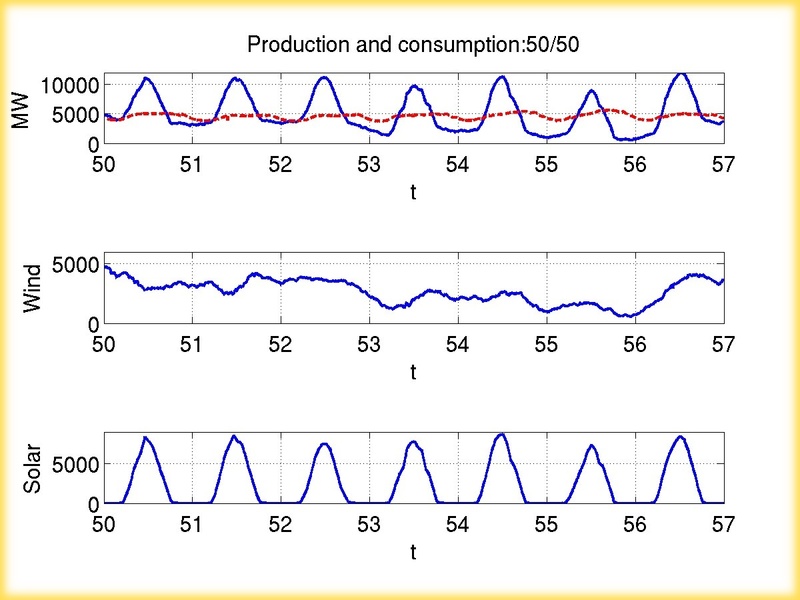 Output over a 12 hour period would vary from zero, then follow a sine-wave up to the peak, then down to zero again. There’d be a dwell of several 5-6 hours at zero on each cycle as the lagoon refilled. Even on a basic analysis, £20Bn for an average output of 1.8-2GW is horrendously expensive. However, the implications for the rest of the system are worse. Average demand in the UK is around 40GW. True baseload, i.e. that level of demand hit on the lowest point of the daily/annual cycle is about 22GW. We run at about that level from around 10:30pm to about 6:30 am – 8 hours. Baseload is supplied by nuclear and coal plants, about 50:50 – highly efficient/low cost plant. On that basis, for 2/3rds of any given month one of the two daily output peaks would take place in the period of overnight low demand. That would mean just about 40% of baseload (9/22) could no longer be supplied by the plant that’s used currently, instead needing to be supplied by rapidly cycled gas. Worse, it’d mean that even in future nuclear or CCS coal (also economically inflexible) couldn’t be used for more than 60% of baseload. RE the teminology debate – renewables versus unreliables/intermittents/undependables. Grid planners use a specific term to reflect the level of certainty of being able to dispatch a given amount of power from any given connected generator. I believe that in the US the term “capacity credit” is used – although that might be more related to “available to generate” payments. In the UK we have a somewhat pithier term “firm capacity”. Firm capacity is the amount of power that it’s 90% probable can be called on from a unit in a defined timeframe. Typically conventional and nuclear units have a firm capacity that’s very close to their declared or nameplate capacity. Renewables/unreliables don’t – wind typically gets rated at 8-14%, solar something similar. So, we have one set of generation technologies that are broadly “firm”. And one set that aren’t. I think we use teminology dereived from this. Let’s call nuclear, CCGT, hydro and so on “firm generation”. for the others, we need termonology that suggests the opposite of “firm”. Yes, having more intermittent sources will lead to throttling other sources like gas more. That will be harder on the equipment, and it will lead to burning more gas per kWh, just as you will burn more gas per km in a car when you step on the brakes every other moment and accelerate again. That in turn takes some of the savings from the low-carbon wind and solar generation away. I am still far from convinced. Actually, I just posted two rather long pieces on what I call the “Unreliables Myth”. I find the word “unreliables” an excellent choice for a shorthand to describe the ideas in the post above (the “myth” part is of course due to the fact that I don’t agree). Your links fail to load. Please re-submit. Karl you are nitpicking because solar and wind *ARE* unreliable. You can’t build a grid on it. The climate scientists say we need to cut CO2 emissions 80% below 1990. That’s more like 95% lower when you consider the actual economic growth over the next several decades. 1. you lock yourself into burning fossil most of the time to ‘back up’ (the energy understatement of the decade) wind and solar. 2. you give ideologically driven energy policy such as the one in Germany, an excuse to not build as many nuclear powerplants as we can to really make a difference. Like El, Karl is trying to win some battles, his blog posts are almost heading towards ‘lawyer science’ where you lose sight of the forest because you look at one tree, but we all have to wake up and realize we’re losing the war. Fossil fuel use is going up, fast. Not down. 8 billion tonnes of coal used worldwide this year, we’re heading rapidly to 9 billion tonnes per year. Solar and wind can’t do much against this rise of coal. They’re simply not reliable and productive and dispatchable. Coal is. In order to beat coal, you need to provide an alternative that is cheaper, more reliable, more productive, more energy dense, and more practical. Only nuclear fits the bill on all fronts, and only if we stop deluding ourselves and take a hard serious look at the numbers. Real numbers, like when is the power needed, when does this energy source X deliver, how do we make it to match so that we can truely stop using fossil fuels. posted 4 December 2011 at 10:36 PM by Cyril R.
The way its done is to determine the ELCC or effective load carry capability of wind or solar. A loss of load probabiliy study is performed so that at a certain load level the LOLE or loss of load expectation is 0.1 days per year. Then the wind generator X MW is added or removed from the base case. The load it adjusted until the LOLE is again 0.1 d/y. The difference in the load levels is the ELCC of the wind or solar. In Texas with West Texas wind the ELCC may be only about 10% of the wind’s capacity. It might be higher for coastal wind. That study determining the ELCC for different regions within the state is currently being studied. In the base case there was more generation capacity than peak load. The additional generation is the reserve margin and its usually somewhere between 12 to 20 percent for different regions in the US. Because the ELCC of wind is so low compared to dispatchable generation, the wind capacity is derated when its capacity is added in with the other generators that are considered reliable sources. I think West Texas wind is only given 8.7% capacity credit. Different regions will have different wind patterns and may have much higher or lower capacity credits depending on how coincident the wind is with the peak load. The problem with the ELCC for wind and solar is that, when the wind turbines and solar panels fail, they fail all at once. That’s because the resource itself is failing, and that affects all wind turbines or solar panels. There are also many windless nights and windless winter and/or cloudy periods, so you also get a lot of solar+wind combined failure. This is called common mode failure in reliability (and safety) analysis. (Fukushima is another but different example of common mode failure). The 0.1 day per year failure rate assumes that failure is random, ie that the power plants are not correlated in their failure. With wind and solar, they’re not random at all, virtually all “failure” is common mode (eg no wind in your area, nighttime for solar). If the power plants are not correlated you can easily tolerate a 0.1 day per year loss of load. Even 1 day per year is acceptable; you have a dozen other generators that can be turned on when needed. Not so with wind and solar, their failure is common mode. The result is that wind and solar both have inherently low capacity credits. The capacity credit also drops with increasing amounts of these unreliables on a grid because you can no longer treat them as negative load (as you could if they were just a fraction of the load). Technically, wind and solar have zero capacity credit, which is what it becomes if you build it out to peak system capacity. The reason for this is simple: you’ve got so much variability in the system that you need to be able to throttle the other plants almost 100%. On a sunny and windy day you run the fossil generators close to 0% output, on a windless night you run them at 100%. Not only does this require a whole new extremely flexible fossil generation fleet (unless you’re one of those few lucky countries to be largely hydroelectric powered) but it also requires that you use these fossil generators about 70-80% of the time. I did the calculation for Germany and found that if their generators were 100% flexible they can only go to 13% solar PV and the rest has to be natural gas or the most flexible IGCC coal (again with the exception of the small amount of hydroelectric and possibly biogas in Germany). We can make some generous assumptions to see when Germany will certainly get into trouble. Germany has a summer noon electric demand of around 70 GWe. PV on a national level never produces more than 80% of its rated power, not even during the sunniest days at noon. So you could build 70/0.8= 87.5 GW of PV before you are producing more PV at summer noon than your demand. This is a quite generous assumption, a high estimate, due to various grid bottlenecks, must run powerplants (eg CHP), must run demand (lots of this, industrial, hospitals, computer servers etc.) wind and biomass in the system that is producing nonzero power, etc. Still, this generous estimate only produces 87.5 GWp x900kWh/kWp = 78.75 TWh. Out of 600 TWh total electric demand, this is 13% of Germany’s electricity. You’ve just introduced a gigantic variation in your grid. So, your other 87% now had better be very flexible fossil powerplants and hydroelectric (but there’s not enough) and you better spend tens of billions extra in your HV and LV grid, governors, voltage controls etc. If Germany had a lot of hydroelectric, like 60-70%, it would be promising. But it isn’t. Most of Germany’s power comes from fossil fuels, and will increase due to the nuclear phaseout. posted 5 December 2011 at 1:26 AM by Cyril R.
When does my opposition to unreliables start? It starts from the first mW that is installed for ideological reasons with tax payer support without reasoned discussion. I wouldn’t necessarily call the IEA an organization prone to extravagant claims about renewables, or overly concerned with small island energy consumption but with global energy trends and key market drivers in industrial and global energy markets. A new IEA report (“Solar Energy Perspectives,” Dec. 01, 2011) looks at solar as a “viable power source for the global economy” (here) and in particular takes up “technologies, market trends, and integration issues.” Solar has been growing at 65% compound annual growth over the last 5 years, and 17 nuclear power plants worth of solar capacity was shipped in 2010 (summarized here). In their powerpoint summary, they conclude the cost of solar is “no longer main limit, but footprint, variability and convenience issues,” they predict solar could potentially provide some 1/3 of world energy supply by 2060, and solar is important in providing “access to modern energy services … potentially changing the lives of 1.4 billion people.” So if costs are no longer a factor, the Maldives and China both benefit from solar (irregardless of size), and wind is anticipated to take up a larger share than solar on a global basis (see IEA technology roadmaps), I’m curious how you square your opposition to renewables “from the first mW that is installed for ideological reasons” with the IEA’s detailed and reasoned assessment that “solar energy has immense potential and could emerge as a major source of energy … [and] that current efforts are warranted to enrich the portfolio of clean and sustainable options for the future” (with technology, market, and integration issues fully considered)? This is entirely incorrect. ELCC probability studies look at real world resource and energy production profiles, correlation of variable power plants with load (and forced outage rates), seasonal, daily, and hourly schedules, wind and solar forecast models, operating reserve capacity, and grid re-enforcements for a particular region. The degree to which wind and solar are likely to fail “together” is an integral part of the analysis, and why wind capacity credits are set so low (in range of 5 – 34% for many ISO regions in the US). The reason for this is simple: you’ve got so much variability in the system that you need to be able to throttle the other plants almost 100%. On a sunny and windy day you run the fossil generators close to 0% output, on a windless night you run them at 100%. Also entirely incorrect. Reserve capacity requirements have a great deal to do with load. And for energy systems with high penetrations from variable sources (up to 35% of total energy output), contingency reserves in range of 1-6% of load are pretty typical (with only half of them operating as spinning reserves). This is far less than the 100% number you indicate, and without credible reference or citation (and with most of your assumptions being wrong). Better energy forecasts assist with integration of variable sources, load and grid management does not always require full operation of planning reserves, and the additional integration or balancing costs for these reserves (when applied to frequency response, regulating reserves, ramping reserves, load following, and supplemental reserves) are typically “10% or less the wholesale value of the wind power” (here or here). I don’t see where any of this is challenging, or all that difficult to accomplish. In fact, I think it’s part of the job description for grid operators in ISOs, and is something they do with great skill (and little complaint) every day they work on the job. Cyril, common mode failure of wind is a part of an LOLP study and this is the reason its not likely that wind will ever make much of a capacity contribution. posted 5 December 2011 at 5:41 AM by Gene Preston in reply to Cyril R.
EL, Gene, yes, that’s what I said. The capacity credit of wind is very low. It also isn’t fixed, it drops as more wind turbines are built. It drops to zero at some point. Which shows how useless wind really is if you don’t have swathes of fossil fuel to burn. posted 5 December 2011 at 9:05 AM by Cyril R.
Better energy forecasts assist with integration of variable sources, load and grid management does not always require full operation of planning reserves, and the additional integration or balancing costs for these reserves (when applied to frequency response, regulating reserves, ramping reserves, load following, and supplemental reserves) are typically “10% or less the wholesale value of the wind power” (here or here). I don’t see where any of this is challenging, or all that difficult to accomplish. You haven’t a clue. Your “reserves” are fossil fuels. Your “assist” means burning fossil fuels. Your “don’t see where any of this is challenging” is true if you have a fossil grid, as we have today. If you don’t want to use fossil fuels, all this changes. I don’t see how this is so hard to see for people who have a lot of time to do research such as EL. I guess its easy to lose sight of the forest when you’re looking at individual trees with a microscope. posted 5 December 2011 at 9:11 AM by Cyril R.
Cyril I think the wind capacity credit will improve when spread over wider geographical areas but not enough to create dependable base load capacity. There has not been a good study on this however so the question remains open as to the ELCC considering a wide geographical area. I’ve never seen a study on this topic I thought was properly done. posted 5 December 2011 at 10:22 AM by Gene Preston in reply to Cyril R.
Karl-Friedrich Lenz — You still are far from convinced of what? EL — Claiming 17 NPPs worth of solar PV is a sales gimmick. 18 GW [nameplate] of NPPs with 92% availablity is vastly more than 18 GW [nameplate] of solar PV with 20% availability. Lets aim for truth in advertising. I don’t agree with the ideas in the post above. Solar and wind are intermittent, but that is no problem for stability now, with low penetration rates everywhere, and won’t be a problem in the future, for the multiple reasons I stated elsewhere. Brilliant Andy! So why don’t we call the “unreliables” the “infirm” technologies. Says it all really! K-F Lenz, you remind me of another fellow who used to comment here regularly – EclipseNow. He used to say just the same sort of things as you do now, but he eventually got it. Stick around, and I guess you will too. You are currently not thinking critically on this problem. It is no good saying ‘I don’t agree’ and ‘that is no problem… and won’t be… in the future’. You must back up your opinions with numbers and real-world evidence. That is what matters on BNC. That is what people like Cyril R and John Bennetts do, which is why they have my respect. @Karl: Somehow your insistence that one should shut up about the problems of scalability since in small amounts wind and solar cause small problems, reminds me of a guy who drops from the roof. Half way down someone asks him, are you OK? The guy responds cheerfully “So far so good!”. It’s not the fall that kills you… it’s the sudden stop at the end. To repeat the point made many times before by many people here, the problem is the lock in of fossil fuel use by the sources like wind and solar. Since storage cannot be done at sufficient scale nor at reasonable costs it won’t be done for anything but PR purposes. Under such circumstances wind and solar are mainly green packaging for fossil fuels. Some might say that what a nice green packaging that is and be happy since it makes people smile. Others might prefer to open up the package to show the people the poo inside so that they would focus on the issues that make them better off for for good. Also, what it the point quoting polling figures as an argument for doing something? Public often supports silly things out if ignorance. I have been reading Steven Pinkers: The Better Angels of Our Nature (I recommend it) and there I found a nice term “pluralistic ignorance”. It can be a stable equilibrium in a game theoretical sense and is probably part of the reason why societies made out of supposedly sane people can do stupid and occasionally even terrible things. In such a trap skeptics keep their mouths shut since they fear ostracization (or sometimes worse) while some others enforce the party line/conventional wisdom in order to demonstrate their own virtue and reliability. There are ways to escape this trap, but I think your way is not one them. Great post Jani and great discussion everybody. P.S. I’ve also “lost” a few weeks of my life reading Pinker and reckon it’s in the running for book of the century … along with Storms of my Grandchildren. This is incorrect as well. Your assist means having fossil fuel capacity tied into the grid, not burning fossil fuels? With retirement of old plants, it will actually be a fairly easy thing to have this legacy capacity around, adding such a modest small cost (10% or less of the wholesale cost) of renewables. Let’s take a conservative (real world) view of where we are heading with current technology. Say wind is contributing 30% of our power output, solar 15%, carbon free baseload another 20%, legacy hydro chips in 10%, and we have a collection of very flexible storage options to 10% of peak demand (NaS storage, flywheels, CAES … all currently available). This appears to be where we are heading today with private sector and ratepayers chipping in the investment capital, modest regulatory or policy support, very low direct subsidy support from the taxpayer, very little adding to the national debt, near grid parity with fossil fuels and coal, and a great deal of benefit to the bottom line of developers (with ROIs in 10-20 year range). Assumptions: all our generators are operating at high capacity values because there is efficiency and conservation in the mix, and the load has been smoothed by nighttime charging of EV batteries. Whatever is left over will be fossil fuels (or some alternative mix of flexible generation), used largely for balancing (ramping reserves, load following, supplemental reserves, etc.). Anybody want to do the math … that’s 25% (and that’s with current technology, low emissions from gas, cost effective, and there is a great deal of research indicating we can do better). You’ll note there’s no coal anywhere in the system. Maybe 25% from natural gas is not good enough for anybody (which would have the emissions equivalent of 8% production from coal). Let’s start building some over capacity in wind and solar, and see what happens. Do you think we don’t have overcapacity in nuclear, coal, and natural gas plants already? Do you think we wouldn’t need overcapacity if we had 50% contribution from nuclear? We’re going to need it one way or another, so we might as well look at how it changes the picture. I’ve already referenced two models above that look at over-building of wind and solar: Heide, et. al 2011, and Zubi 2011. For Heide, overbuilding has a large impact on storage requirements for a fully reliable and well managed grid. Heide proposes a model for the whole of Europe (at 3240 TWh/year), 100% renewables, and looks at how excess generation would impact storage requirements. Excess generation to 50% reduces storage capacity requirements from 510 TWh (at 265 GWe capacity) down to 160 TWh (and 200 GW capacity). The study concludes that at 50% excess production, “storage lakes in Norway, Sweden, Austria, and Switzerland” currently hold the required amount of stored energy for a 100% renewables grid (at 150 TWh), although capacity is somewhat low at 55 GW. Zubi 2011, on the other hand, is concerned with costs. Overcapacity in this example lowers the costs of energy because curtailment is used more often for balancing than flexible resources. In short, powering up flexible fossil fuel generators is one approach for dealing with load balancing, others include curtailment, “energy storage, demand control measures, interconnection of renewable energy resources with a supergrid, etc.” (p. 8076). All of which have been mentioned above. Lock-in is not the only game in town, researchers appear to be quite adept and skilled when looking at other options (all within the context of reasonable costs, currently available technology, and the highest standards for grid operability). There are many studies that suggest the same. Solomon has been doing very detailed studies on the Israeli grid (here and here), and looking at overcapacity (to 20%), current storage technologies (a mix of fast responding buffering storage and slow responding bulk storage), and very high penetrations of solar (to 60-90% of total electricity production). An economic analysis will be forthcoming. To speak as clearly and plainly as possible. It seems odd to me that we have to argue and debate about these matters (when they are fairly conventional, easily quantified, and well established approaches to capacity planning and grid operations and management). In fact, I would argue we have a great deal of consensus about these operational standards, and how hard it is for any generation source to take up a dominant share of the resource mix (nuclear included). For anything above baseload, many of the same issues of flexible generation, buffering reserves, load following, regulation reserves, etc., also start to show up for nuclear. 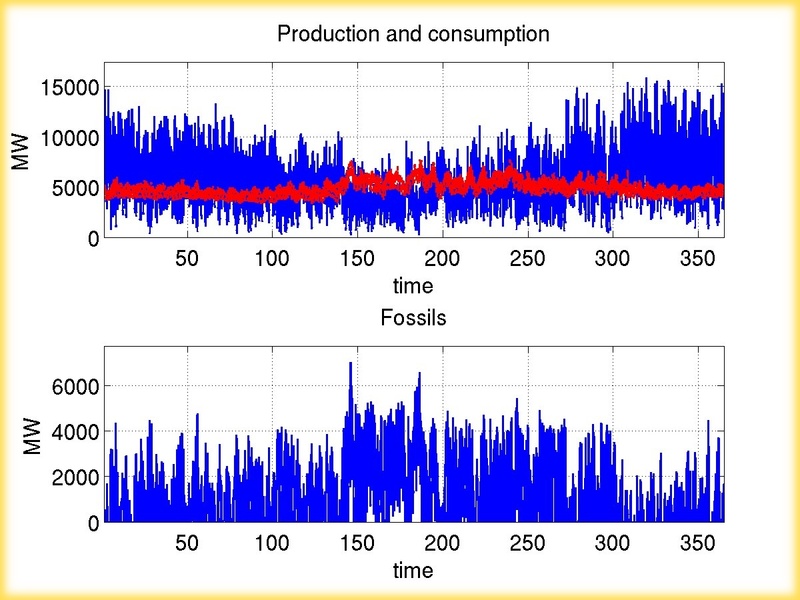 We don’t have to worry about it at the current low levels, with fossil fuels in the mix, or where grids help to distribute the load (in a manner very similar to excess generation described above). We’ve been doing these kinds of things for 50 or more years, why does anybody think we are going to stop doing them more effectively in the future and with more efficient, cost effective, and less polluting technologies at our disposal? If your arguments sound out of date, they probably are! Renewables aren’t green packaging, as Jani suggests above, they are a “viable power source for the global economy” (as the IEA describes it today). Average demand is 40GW (roughly), of which about 22GW is true “baseload” – i.e. demand rarely if ever drops below that. Peak demand is roughly 60GW. The obvious starting point is “wind is contributing 30% of our power output, solar 15%, carbon free baseload another 20%, legacy hydro chips in 10%, and we have a collection of very flexible storage options to 10% of peak demand”. The starting point is that that doesn’t actually add up to current average demand – it gives us 30GW – (12,000MW of wind production, 6,000MW of solar, 8,000MW of “carbon free baseload – which we’ll return to later) and 4,000MW of legacy hydro. Storage doesn’t of course add to average production – if anything, due to system inefficiencies, it requires additional net production. If we assume storage to be 90% “round trip”efficient – a lot better than pumped storage attains, for instance – your “10% of peak demand” implies an extra 600MW of average demand. We’re therefore at just 74% coverage. The fact that you can’t even spot that your proposal doesn’t add to 100% hardly inspires confidence, by the way….. However, we’ll simply uprate the capacities to compensate. That means I need average production (to the nearest 100MW) of 16,200MW of wind, 8,10MW of solar, 10,800MW of “low carbon baseload” and 5,400MW of “legacy hydro”. Let’s look at capacity factors – current UK average for on-and off-shore wind is roughly 26%. We haven’t a significant solar installed base, but we’ll use the German figure – 9%. I’ll assume the “low carbon baseload” runs at something like Sizewell B – 88% over life to date. And I’ll assume 65% for hydro averaged over the year (since that will be largely dedicated to covering some of the daily “swing” of about 20-40MW). That implies installed capacities of 62,500MW of wind, 90,200MW of solar, 12,300MW of “low carbon baseload”, 8,300 of “legacy hydro” and (from your original “10% of peak demand”) 6,000MW of storage. Total system capacity ends up at 179,300MW, against an average demand of 40,000 – implying an overall system capacity factor of just 22%. The first and obvious comment is, in fact, wind and solar can’t attain those nominal factors. They’re based on unconstrained input to the system – and, in this case, there simply isn’t the demand to soak those up. At times of peak wind production (even assuming no solar output at all), you’d not only end up cycling out all the hydro and “low carbon baseload”, but rejecting somewhere between 2,000 MW or 34,000 of wind production (and on average, 16,000 MW) . That will inevitably depress already low capacity factors. OK, what level of firm output does that get me? Solar and wind have similar ratings – about the 8 for wind and we’ll assume 10% for solar. If I assume 95% “firm” rating on the “low carbon baseload and storage, 80% on hydro (reflecting the probability of low rainfall in some years), the total firm rating is 38,000MW. Let’s be clear what that implies – I’m roughly 90% sure of being able to supply just over 95% of AVERAGE demand. More crucially, it means I’m all but certain of a shortfall of AT LEAST 22,000MW against peak demand – or 37% of total peak demand. That’s from a grid with a near five-fold redundancy against average demand. On capital costs alone (taking wind as a 20-25% O&M cost) that implies a near four-fold increase in unit cost. Conventional grids, by the way typically run with 15-20% redundancy, to get a production shortage probability in the order of 0.001%. In reality, it underestimates exposure, of course, since that model treats the wind units, and the solar units as behaving independently – which they don’t. Two last comments – I’m not sure what you’re assuming as “low carbon baseload”, but there seem to be only two viable technologies in that role – nuclear, or CCS (gas or coal). You may have noticed that CCS projects are dropping like flies. The cancelled project at Longannett, in Scotland, would have cost £1.5-2Bn for sequestration of about 300MW-equivalent of coal generation. By contrast, the capital cost of a 1000MW supercritical coal station is £1-1.5Bn – in other words, the sequestration fit would increase the capital cost per MW by a factor of somewhere between 4 and 7. It also increases coal burn by 25-40%. In other words, it makes capital costs similar to, or higher than for nuclear plant, but adds a large fuel costs that’s absent in nuclear. I’d also be interested to know what backs up your comment about storage being available – I’m not aware of battery systems being demonstrated about the single-figures MWh range, or flywheels less than that. Even then the costs are horrific. Thanks Andy, far more useful numbers than wild quotes of percentages without megawatts. Clearly the wind and solar route means dumping loads of solar and wind when both are available, and still burning lots of gas in the winter when there’s still no sun. I think many readers of BNC are living in sunny countries such as Australia and the US Southwest. They’re mostly not familiar with northern European climate in winter. Regarding the IEA stating that solar is a ‘serious energy source’ as EL puts it. I do not see any reason for optimism. Here’s the most recent World Energy Outlook from the IEA, where global natural gas use increases 63% in the next couple of decades. Natural gas imports more than double. Coal and oil also increase, and total fossil fuel consumption increases 26%. Fossil fuels provide 76% of global primary energy demand in 2035. All wind, solar, wave, geothermal together is stuck at a feeble 4% of global primary energy. So much for solar having become a “serious energy source”. Fossil fuels are increasingly more serious than anything else. In a timeframe we need to be halving fossil fuel use, we’ll increase it by at least one quarter. This is not good. Not good at all. Here’s also an excellent graph from David Mackay, on the total wind output of Ireland – one of the windiest countries in the world. That’s a lot of variability! If the wind speed doubles you produce 8x as much powe, if the wind speed halves you produce 8x less. This causes the heavy jerking behaviour of wind. It’s fundamentally an unreliable mathemetical function, where small changes in wind speed mean big changes in power production. As we can see from the graph, a one day energy storage isn’t nearly enough. Typically the wind goes out on low wind days for 1-10 days at a time and its extremely random. David Mackay suggests to use at least a full week of energy storage. That’s generous if you don’t want to use natural gas – there will be many long and duration outages nationally every year. But let’s say we accept a little natural gas burning at these times, realizing the world isn’t perfect, and perfect is the enemy of the good. Energy storage isn’t the subject of this thread but just for a short indication, lets do some numbers. To get enough power for all existing electricity supply plus electric vehicle charging plus heat pumps to heat your home and provide hot water, requires an average flow of 1.5 kW of electricity. One week of that is 252 kWh of electricity storage. Realizing the heat pumps and electric vehicles could be used for effective load deferring, we can remove about one day of energy storage, leaving 6 days. That’s 216 kWh that we need. If it is 90% efficient that we need an extra 10%, 216/0.9 = 240 kWh. The best NaS cells get 240 Wh/kg (coincidence that this is the same figure, funny world isn’t it?). 240/0.24 = one metric ton of batteries per person. This one ton battery per person needs to be replaced every 10-14 years at least (cell float shelf life). The cost of this battery, at today’s $300/kWh, is $72000 per person. At an optimistic future cost of $100/kWh, it is still $24000 per person. This is a recurring cost, every 10-14 years you need to buy another $24000 battery. Clearly we are not going to do this. We are just going to burn natural gas whenever the wind isn’t blowing and the sun isn’t shining. Please redo your calculations for the percentages I have provided, since it looks like your result may be interesting. You’re going to have to read my post much closer, the missing 25% comes from peak flexible generation such as natural gas. You may have noticed that CCS projects are dropping like flies. The pilot project in Yorkshire, UK just opened it’s doors 5 days ago (at some 50 times the scale of previous projects). We have a whole thread on that over here, and it appears you haven’t kept up with current commercial deployment. Here’s a sample of deployments of the NGK batteries to some 200 MW (1,200 MWh). Hitachi factory installation is rated 8 MW (57.6 MWh), Rokkasho wind farm has 34 MW (245 MWh) battery operating since April 2008. That’s a lot of variability … As we can see from the graph, a one day energy storage isn’t nearly enough. And this is why we have capacity reserves! This is an entirely incorrect and faulty analysis! In the high renewables and deep GHG emission cuts technology pathway described in a general sense above or more specifically in the literature, there is no need to have full energy storage for 6 consecutive days. In the storage thread on this site, I described why 8 to 12 hours is sufficient. I’m not sure what you don’t understand about energy capacity and resource planning, but it seems to be quite substantial on your behalf. I know of no study that proposes full replacement of a national grid with storage in this way, and nobody is trying to work with such a faulty and unwise planning model in order to arrive at a fully cost effective and highly flexible energy system with deep green house gas reductions and very high system operability. You are currently not thinking critically on this problem. It is no good saying ‘I don’t agree’ and ‘that is no problem… and won’t be… in the future’. You must back up your opinions with numbers and real-world. That is what matters on BNC. That is what people like Cyril R and John Bennetts do, which is why they have my respect. I feel the same way about nuclear proponents who write uncritically about the promise of nuclear (which also includes significant fossil fuel lock-in). Do we have any “real world” examples or “numbers” to look at, and not just opinions? Yes. France overproduces and exports 14% of it’s energy, hydro is 10%, it also imports 15% of it’s domestic consumption from coal and natural gas (12% as a gross measure if you don’t count exports), so I don’t see where these performance measures are all that different than the renewables (with over production and fossil fuel scenarios) listed above. Efficiency and conservation programs are very poor (the worst in EU), because state owned utilities must promote consumption as a primary tool for return on investment (over a 50 year period or longer). And we don’t really know the full cost of the program, which includes large subsidies for finance capital, R&D, reprocessing, and waste disposal (shared with the taxpayer). So yes, let’s have this debate, but let’s keep it to the facts. On the numbers, it appears to be no better than a credible renewables portfolio (to 45% of generation from wind and solar, 10% from hydro), and have a great deal of private capital and free market equity in the mix (rather than central government planning), quick investment turnarounds (with ROIs in 10 to 20 year range), scalability for large industrial markets, developing economies, and off grid deployments, and far fewer of the long term waste, reprocessing, peak fuel, social disapproval, and national security headaches of a high nuclear option. To speak honestly about this, we seem to be going around in circles and circles on these things, and on matters that for most people are already decided and have a high degree of consensus around them (as I have tried pointing out in the scientific literature). The IEA has joined the consensus, and while opposition to conventional thinking is a very good thing, one should at a bare minimum understand why they have done so (before coming up with a response that they have overlooked something in current technologies, market trends, or integration issues). sorry, but on your own numbers, you’re assuming 12000MW of average wind production, and just 6,000 MW of storage (with no comment as to it’s capacity – and sufficient gas-fired generation to produce up to 25% of generation. We most certainly see extended (multi-day) periods of near zero wind energy production in the UK – we’ve had a 5-10 day period of production of <5% of nominal capacity in the last three winters, for example. And the UK, let's recall, is supposedly one of the most wind-favourable environments on the planet! "Yes. France overproduces and exports 14% of it’s energy,"
you're still mixing up electricity production and overall energy use. I suspect also, that that's a gross figure, not net. For example, there's a 2GW anglo-french interconnector. That sees flows most of the time – but, since our clocks are an hour different, we use it for peak balancing. The net flows are only about 25% of the gross flows. "so I don’t see where these performance measures are all that different than the renewables "
It’s not hard to look at the graphs I provided and see many if not most low wind periods are more than one day. By logical extension you need more than a day of energy storage IF you want to stop using a lot of fossil fuels. EL doesn’t care about using swathes of fossil fuel to back up the unreliables, but many here do, including me. posted 6 December 2011 at 8:52 AM by Cyril R.
Your citing of the new pilot plant does not really contradict andy’s claims about CCS. In fact, the guardian article cites the facts Andy notes about the recent difficulties faced by CCS projects. The pilot at the Ferrybridge power station, designed and built by Doosan Power Systems, will capture emissions equivalent to 5MW of generation. This is a small fraction of the total exhaust gas from the 2000MW plant, but 50 times bigger than the previous biggest pilot, the company said. The carbon dioxide captured will not be stored, as this pilot is aimed at testing the scrubbing part of the process. Do you favor CCS over nuclear? This is what Barry meant by looking at reality, EL. Germany is the renewable way, which doesn’t work, you end up using just as much fossil fuel in 30 years of trying. France is the nuclear way, where even EL admits you only use 10% fossil in the grid, in only 20 years. As opposed to Germany that uses over 60% fossil after spending far more per capita trying to power its country on wind and solar. France has a 80% nuclear, 10% hydro, 10% fossil grid. For sure it takes a long time to build a nuclear powerplant. Building a few solar panels is much faster. Yet it takes forever to build ENOUGH solar panels. You also need at least a week of energy storage to get to the same level of reliability and grid-fossil-free-servicing as a nuclear powerplant fleet. posted 6 December 2011 at 9:03 AM by Cyril R.
I’m quite impressed by the number of ways EL can say “burn lots of fossil fuels”. I only know of a few ways to say this. EL knows lots of ways, from capacity reserves to scheduling generation. An impressive vocabulary EL. posted 6 December 2011 at 9:06 AM by Cyril R.
We most certainly see extended (multi-day) periods of near zero wind energy production in the UK – we’ve had a 5-10 day period of production of <5% of nominal capacity in the last three winters, for example. So are you saying they aren’t using capacity reserves in the UK to match electricity generation to demand? As I have documented in energy storage thread (and referenced in the peer reviewed studies above and elsewhere), storage to 10% of installed capacity and with 8-12 hour discharge is entirely sufficient in every study I have seen to achieve very high penetrations of renewables (certainly to a low 45% of energy output as I have suggested above). This number is much higher in studies where over capacity in renewables, demand control, geographic smoothing, storage at proposed level, and other grid management methodologies are discussed (here and here). You should be able to do the math at this point. Let’s do a costing for a hybrid storage system for the entire US grid (1/3 pumped hydro, 1/3 CAES, and 1/3 NaS): at 100 GWe capacity and 800 – 1200 GW/h energy storage. Build time is 40 years to 2050 (only looking at current costs). With these very conservative and current cost estimates (for a grid that is very flexible and secure at 45% renewables, and likely much higher) total storage costs would be in range of $101 – $152 billion over 40 years (or $328 – $495/person over 40 years, or $8.2 – $12/person per year). This is not a very big number (considering the scale of our energy consumption in the US and robust grid). The US currently spends an estimated $100 billion/year in Afghanistan alone (enough for entire build-out). Savings from power outages, where storage costs offset business losses from power interruptions (especially in less than 5 minute range), would exceed costs by a factor of 1:21 – 1:32. Storage also “has value” in ancillary markets, so these costs pay for themselves. And this picture keeps getting more and more attractive as costs of renewable energy generation and storage costs continue to decline, and trend towards grid parity with coal and fossil fuels. Sustainables have already surpassed nuclear in share of domestic production in the US, and I don’t know what is confusing to people here about these costs and trend lines? EL: do france and sweden have the cleanest electricity grids or not (following Mackay)? much cleaner than denmark, spain, or germany? If it’s true that France and Sweden are much cleaner, it suggests that nuclear is far better than renewables plus fossil fuels. On fossil fuel lock-in, are you suggesting that nuclear’s capacity credit is no better than wind’s? because the fossil fuel lock-in criticism of renewables is based on their low cf and cc, as I understand it. this study of course includes ethynol and, the biggest hunk which is not rising significantly, hydro. Remove hydro from the mix, most of which existed before the first nuclear plant ever went on line, and your numbers don’t look so good. Sustainables have already surpassed nuclear in share of domestic production in the US, and I don’t know what is confusing to people here about these costs and trend lines? That includes hydro, biomass and biofuels. These account for 84% of the renewables, according to article you cite. Which, if I recall, has been commented on here as the misleading piece it is. I have looked at two of your sources in five minutes and found that you cite both in misleading fashion. I have no preference how we get baseload into the system … I only have concern for credible and real world approaches to cost effective carbon mitigation on a global scale (OECD, developing countries, off grid) without waiting 50 to 100 years for results. I also favor real world credit market financing and private sector business development, which seems key to any scalable solution (anywhere on the planet). I also believe energy efficiency and conservation need to become primary concerns in energy delivery, I also favor sustainable energy technologies that don’t lock people in to non-renewable fuel imports and over-exposure to marginal price volatility and risk. If nuclear meets these objectives, I’m all for it. Remove hydro from the mix, most of which existed before the first nuclear plant ever went on line, and your numbers don’t look so good. From 2006 to 2010 wind increased from 4 to 11% share of renewables. Solar experienced steady 12% annual growth rate. Hydro decreased due to low water. Biomass was up slightly (49 – 53%). EIA energy outlook anticipates high future growth rates for solar (PV capacity 17% annual growth per year from 2009 to 2035) and wind (48% capacity growth from 2009 to 2016). Share of nuclear generation in the US appears to be holding steady at 20% since about 1988.
well, as wind only contributes about 2% of production, it’s hardly as yet a major issue – but yes, we vary production on fossil fuel plants to match demand – constituting about 80% of total production. Which means we’ve lots of plants available – but, of course were they run intermittently, their economics would look very different – and probably infeasible. And, of course, puts out a LOT of carbon. Which rather depends on starting assumptions – and as a rule, ignoring cost. And it simply assumes that fossil will step in for any extended period of unavailability. Which, since the whole point is to reduce CO2 output, at feasible cost…..
for a start, the US grid is rather larger than 100GW – indeed, nuclear capacity alone is of that order, and with a population between 5 and 6 times that of the UK, and higher per capita energy use, assuming something 2 1/2 times UK average demand, and about 60% higher than UK peak load is a tad unrealistic. In fact, 2008 US electricity production was 4,369 TWh (IEA figures), which I make as just under 500GW average output. That 100GW reserve covers just 20% of output – which, since you’re apparently proposing 45% of production from intermittent renewables means the great majority of the variation in that is actually covered by fossil fuel. But accepting that, I’m unsure as to where those numbers can come from – new build PS hydro costs between £1bn and £1.5bn/GW, and even accepting US costs are lower, they’re not lower to a £:$ equivalence – so – so $50Bn will be closer to the mark for 30GW. And, of course, it slightly begs the question of where exactly you’re about to put an extra 33GW of dams – given the environmental pressure is to dismantle the ones you’ve got. Recall, PS is harder to place than conventional hydro – you need large lakes at both top and bottom of the dam. Even at $200/Kwh for NaS, that 400GWh of storage comes in at a heady $80bn; and the lowest price I can find for CAES is around $1500/Kw, so another $50Bn or so. So, $200Bn – and no, over 40 years, allowing for something as low as a 7% cost of capital, that’s nearer to $800 billion (always a good bet to assume you can get free capital). Add something as low as another 7% O&M (low, if anything, given the life limitations of systems like NAS), and you’re getting into the region of $1.3 trillion. For enough storage to keep you going for 8-12 hours, covering perhaps ½ to 1/3rd of US demand – with 55% coming from non-renewables, by your own admission. Add efficiency losses, and the cost of the renewable generation itself, and pretty soon you’re talking serious money. Remember, you’ve still got to allow for massive redundancy in the renewable plant – it’s not just a matter of $n/MW of nameplate capacity, it’s about cost adjusted so it’s $n/Mw of average output. I can’t talk for the US, but here, we see net transmission and generation reliability (in terms of failure to supply) at about the 99.9997% level. What failures we see are at local distribution level – which would be entirely unaffected by what you propose. There simply aren’t enough minutes lost to give the sort of benefit argued, by a couple of orders of magnitude. Perhaps the US needs to sort basic grid reliability, which can be done a lot more cheaply that this sort of money. And again, think on it this way. To get 800-1200GWh of storage, costs even on your estimates between $100 and $150Bn – excluding the cost of generators to supply it (so, of course, the actual cost to supply is the SUM of the two). For that same sort of money and assuming series build gets me 30-45GW of actual generation, Not just short term back-up for generation. Andy – as per BNC Comments Policy please back-up your contentions with refs/links – preferably peer reviewed. of renewables, note – not of energy or electricity use. In other words, there’s an increase from a really tiny base. To a not statistically distinguishable, ever so slightly less tiny base. In particular, pumped hydro for just overnight rechanging is quite expensive. Worse, the USA has almost run out of places to put (more of) these. One can always build underground pumped hydro, but look to the cost. France certainly produces more electricity than it consumes. It is also true that it exports baseload electricity (read nuclear) and imports for peak demand (read fossil fuels). It is also true that the exports have been in the order of 15% of production net (or ~75TWh) over a year. That was the case in 2005 and before. These last years have seen less exuberant exports. In 2011, this kind of exports will be seen again, thanks to the closure of 8 reactors in Germany. That points to the reason of these massive exports: there is demand for baseload electricity outside France. EL provided an IEA document showing that Italy is the 1st importer of electricity world wide. This is possible because nuclear is not a fatal source of electricity, it can do some load follow (as the case of France shows), and can be started/stopped on demand. On the other hand wind output is forced upon us. So it may be technically possible to overbuild wind capacity to provide electricity all the time, even at peak demand with low wind power output, but the posts by Jani-Petri Martikainen show that overbuildind is required on a massive scale. When wind is blowing, we could just disconnect wind turbines. But then the capacity factor of these turbines will drop to very low values, sending the price of electricity through the roof. So the problem is not just a technical problem, it is also an economic one, and this economic challenge is a major one. Some countries like Australia may be flush with money right now, but in Europe, it is not the case. Following the financial meltdown and the euro crisis, every taxpayer penny will now be counted, and every penny spent on energy policy will not be spent on welfare, army, justice, etc. You can turn to the electricity consumer to pay for this, but the problem is the same! You are correct. US generating capacity is 10 times larger than this (at some 1,010 GWe), which is why I selected 10% of this (or 100GW) as the relevant energy storage amount. They come from the reference I cited in my post: “Energy Storage Systems Cost Update: A Study for the DOE Energy Storage Systems Program” (Sandia Report, April 2011). The US already has 17.24 GWe of pumped hydro storage. We’d need an extra 15.8 by 2050. Using the Ludington pumped storage plant in Michigan as model, we’d need additional storage with a reservoir size of approximately 10.9 sq miles (or 28.56 sq km). If it can be built in Michigan (highest elevation 1,979 ft or 603 m), it can be built in many locations. You’re confusing capital construction costs and energy storage costs (per unit of discharge capacity). These are two entirely different numbers. This is not how energy storage is used by developers or grid managers. All your generation sources keep you going for 24 hours (to the extent they are needed to match the load), energy storage is used for frequency regulation, off-peak capture, load leveling (or peak shaving), black start activation, T&D support, micro-grid formation, industrial or commercial building uses, residential, and much more. Replacing all the power on a grid is not among the intended, practical, or cost-effective applications for ESS. thanks for the references you provide on pumped storage. The power output figures look impressive, but give no indication of how long they can keep that power up.
. Once again, watts are not energy storage amount, they are power, only with the time span do we get energy. Only this can give a realistic indication of how long a wind or solar lull can be balanced out. There are many ways to make these calculations, and assumptions matter a great deal on the kind of results you will get. For simplicity purposes, I have set discharge time frame to 8 to 12 hours (regardless of technology). This is a tad long for NaS, which currently has a energy storage capacity of 8 hours (in current commercial models). So you might need a little more in terms of capacity to get to 12 hours (or reasonable technical improvements, which are likely forthcoming). This largely adds to costs, and not technical feasibility. For land and geographic dimensions on PHS, I used the pumped hydro storage plant in Ludington as a base case (which has “more than 8 hour” capacity). I fully admit these are expensive options, we’d like storage costs to be around $100/kWh for widespread market penetration of bulk storage support, a hybrid approach gets us close to this ($126/kWh based on Sandia cost estimates), and we can do better. Energy costs are rising too (particularly with grid congestion and peak energy pricing), and the attractiveness of energy storage with energy arbitrage is closely linked to this. I wonder if there will be an update to this excellent article. Here in Adelaide the Universities in conjunction with the private sector are doing some very worthwhile work on energy storage technologies to be an adjunct to solar power and wind power. The Australian Federal Govt. 20 percent renewable energy targets (in theory at least) have given a boost to investment to energy storage – we await with interest the outcomes.